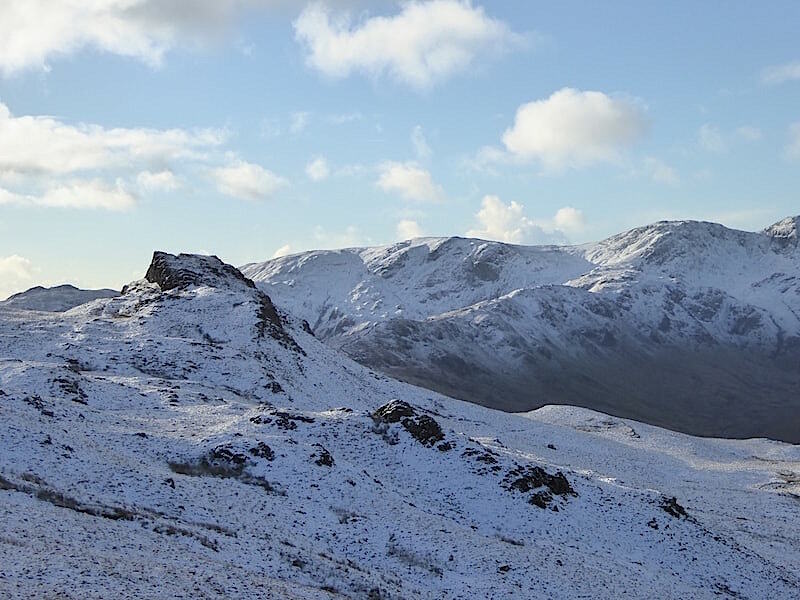 A very cold night would be followed by a bright sunny day, said the weather forecaster, and having viewed the snow on the higher fells from our walk on Hallin Fell yesterday we decided we’d put the day to good use by taking a walk along Martindale up to Angletarn Pikes and then return to Martindale via Beda Fell. 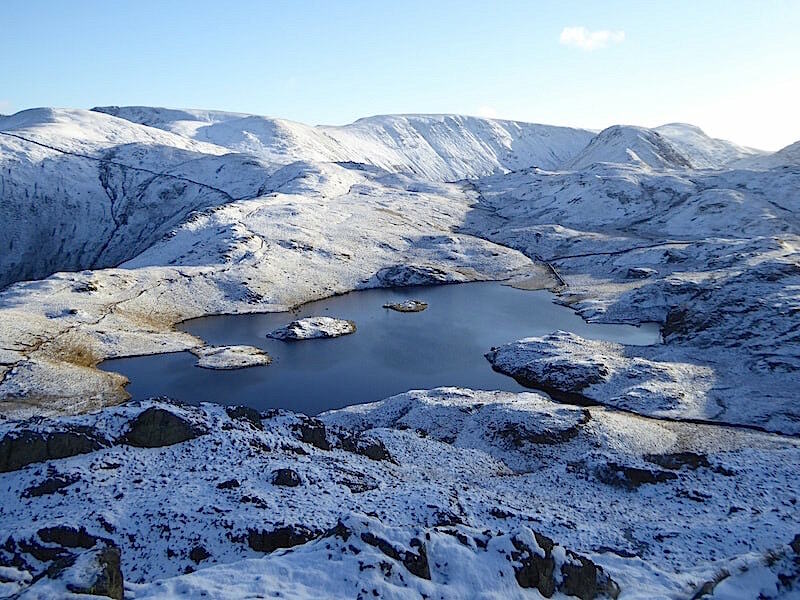 We had a fabulous winter walk in glorious weather and the combination of scenery, snow and sunshine was far too tempting, snap happy doesn’t begin to describe it, and by the time we were back at the car I had taken over a hundred photos. You will probably be relieved to learn that I haven’t included all of them in this walk report. As usual we parked by the old church of St Martin, no other cars there but a couple or three large farm trailers were taking up quite a lot of the space on the grassy verges on both sides of the road. The road is thick with ice, the valley is still in shade and our breath hits the cold air in clouds of frosty white vapour as we cross the bridge over Howe Grain Beck. 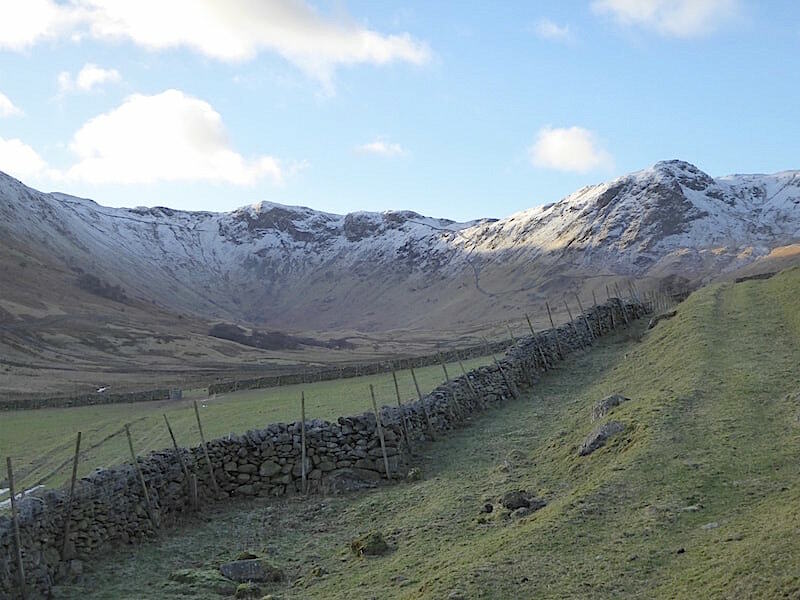 Walking along the treacherously icy Martindale lane up to Dale Head Farm. What looked like water was solid ice and wherever possible we kept to the slightly raised and mostly ice free gravelly centre of it. On three occasions we had to step to one side for a chap driving his quad bike and trailer of hay up to the sheep in the fields just below The Nab, the sheep still need feeding no matter how cold and icy it is. 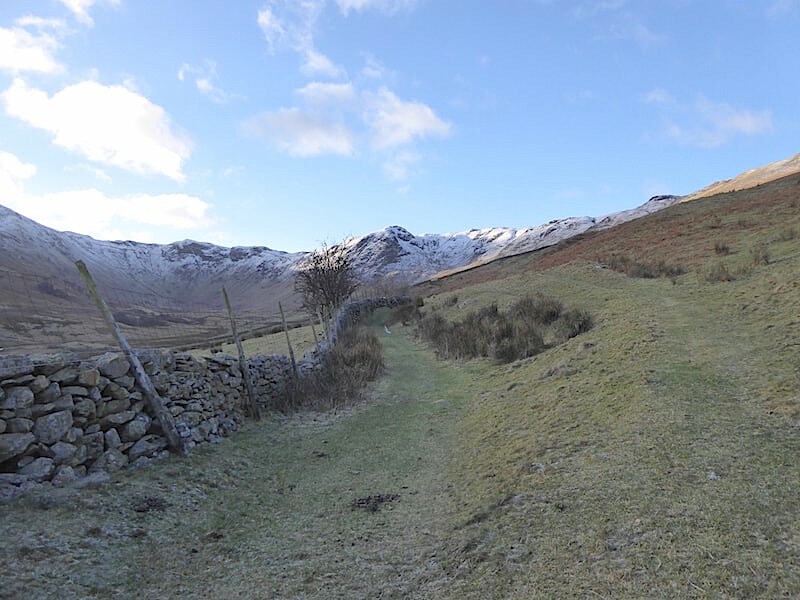 Where water had drained off the fell sides and covered the width of the road in sheet ice we resorted to using the grass verges. 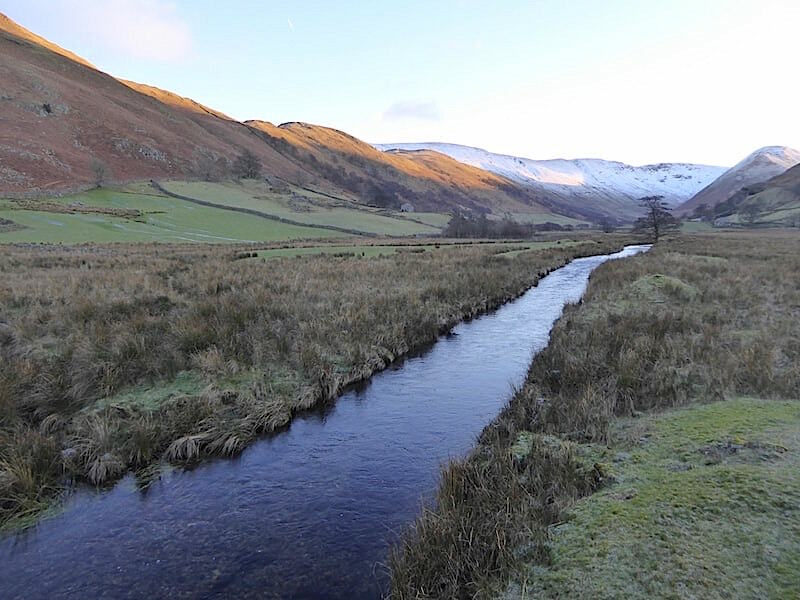 Apart from the hum of the quad bike engine and the crunch of our boots the valley was silent and still. 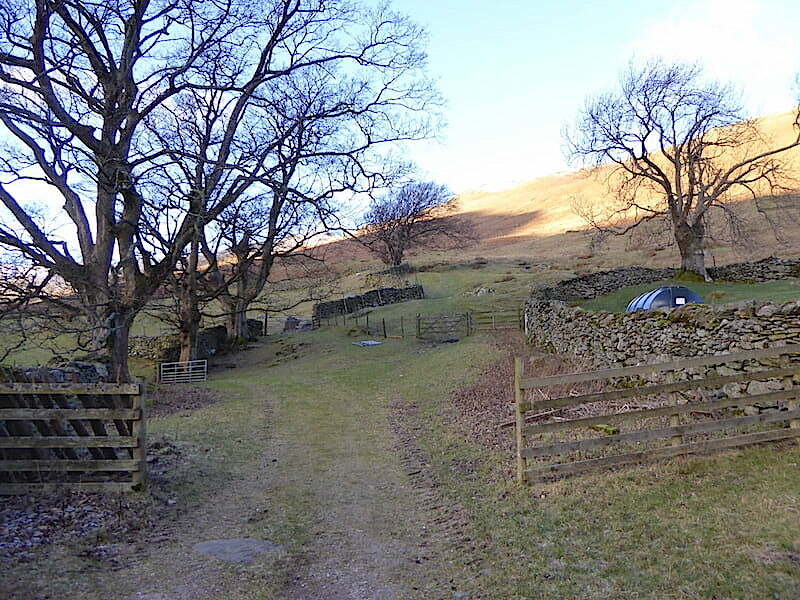 After almost a mile and a half of road walking we reach Dale Head Farm where the tarmac lane ends and the footpath begins. 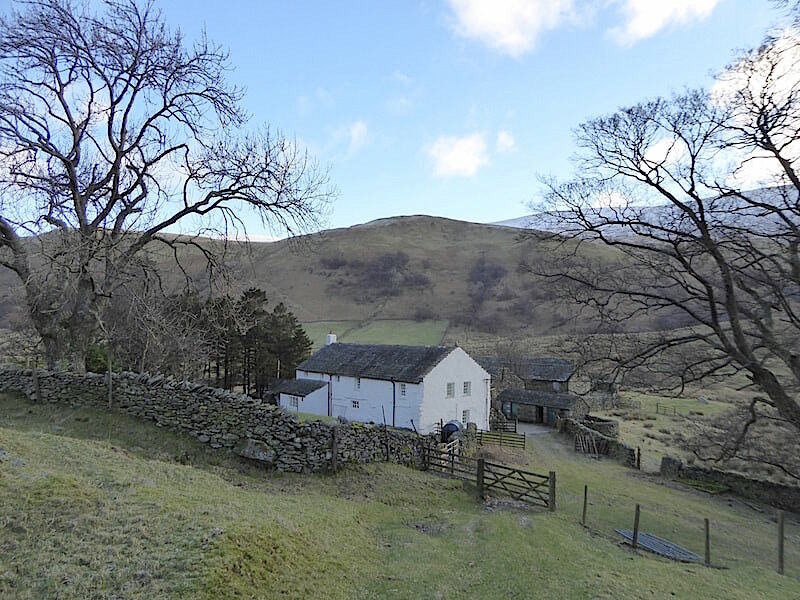 We walk just beyond the farm buildings and then turn right to begin the climb up to the Beda Fell ridge. 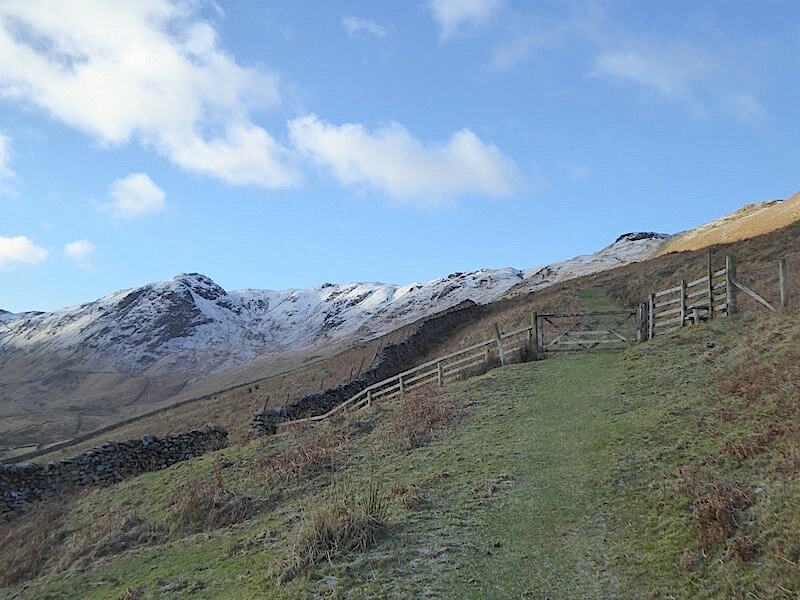 We pass through the gate up ahead and begin to look forward to enjoying some of that fell side sunshine up there. 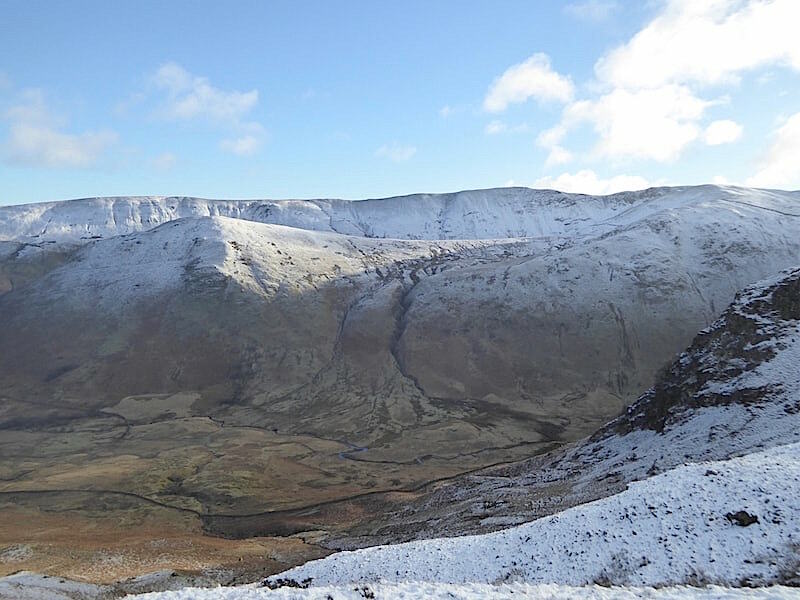 Through the gate and a little higher now so the head of Bannerdale begins to appear. 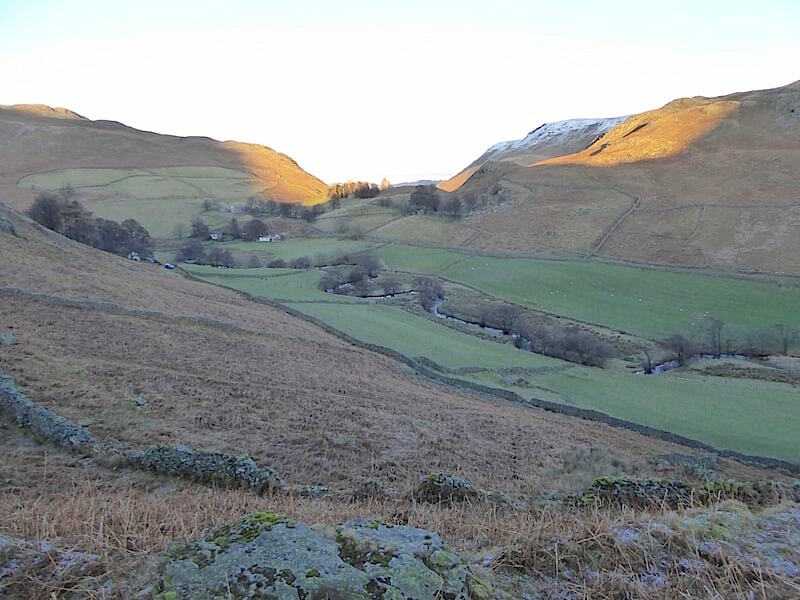 The northern slope of The Nab, rising to the left, splits the valley of Martindale into two further valleys, this one on its western side, and Ramps Gill on its eastern side. 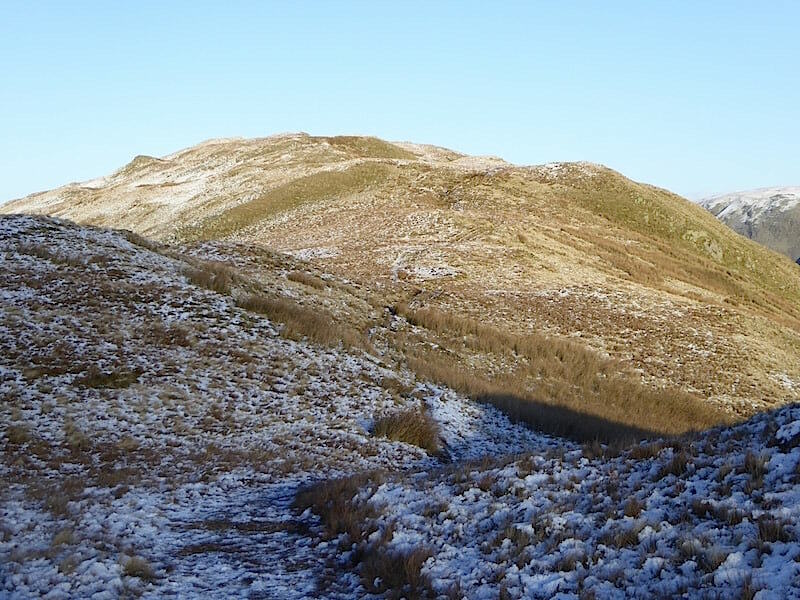 The sun is still hidden behind The Nab so we continue along the frozen grassy path in the very chilly shade. 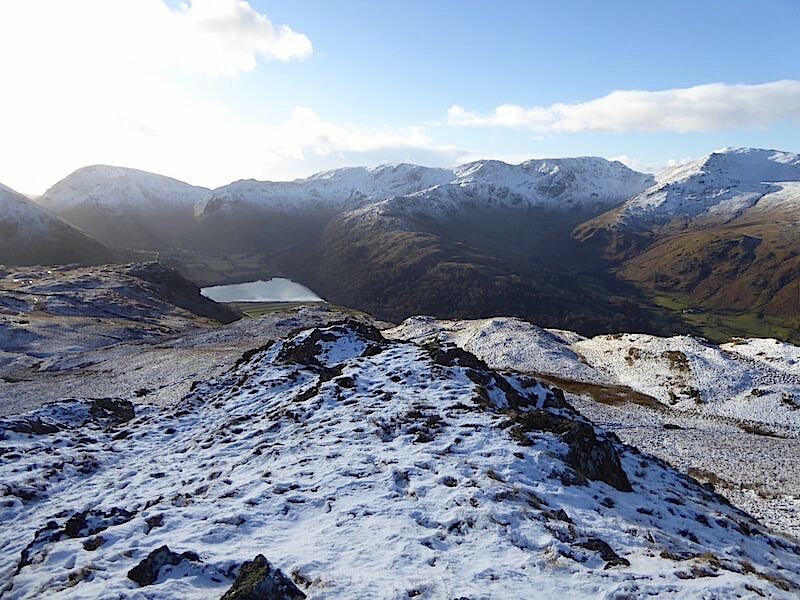 A look back at Dale Head Farm. As we passed we could see Christmas cards and decorations through the windows but no sign of anyone who might be living there. A little further along the path splits and you have a choice of routes. 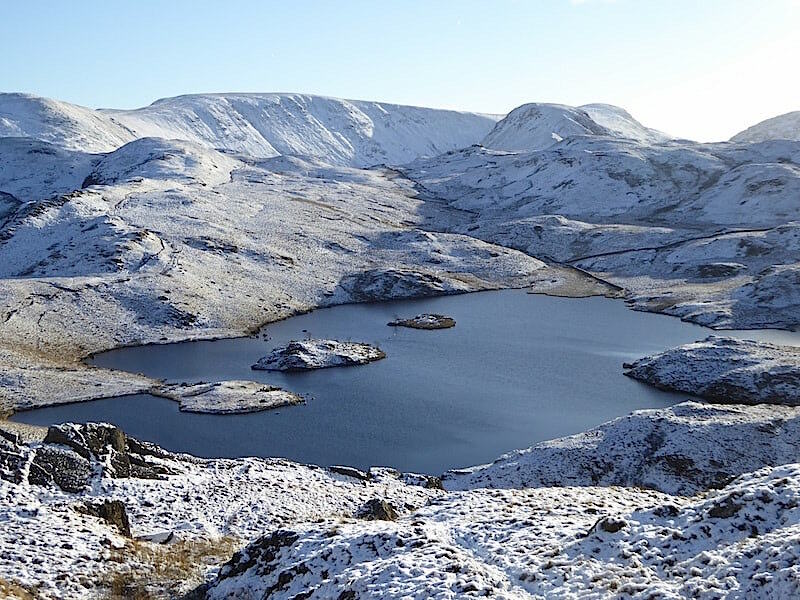 The lower path continues alongside the wall and passes high above the head of Bannerdale along a narrow path below Heck Crag, eventually bringing you out onto the ridge with a lovely view of Angle Tarn as a reward for all your efforts. 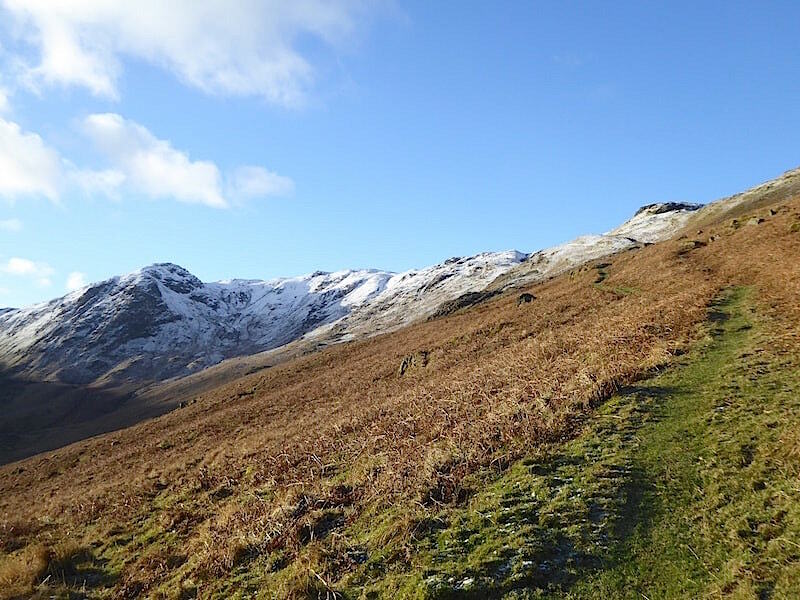 If you’d like to see what the path looks like, below is the link to the walk we did in April this year, although you will need to look at the photos towards the end of it because we used the Heck Crag path as our descent route on that day. 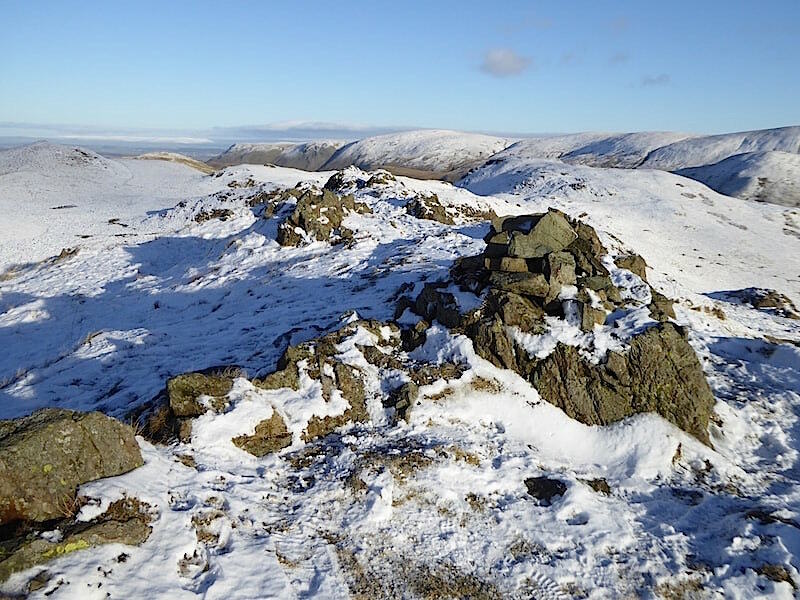 Today we take the higher path across the slopes of Beda Fell. We’re still in the shade as we reach the next gate where the stile came in handy as a bench for a two minute breather. At last we reach the sunny upper slopes where our faces can begin to thaw out and we can actually speak properly again. It feels a bit like when the injection you had at the dentist is just beginning to wear off but you still can’t persuade your mouth and lips to form the words. Much higher now and we begin to reach the snow line. 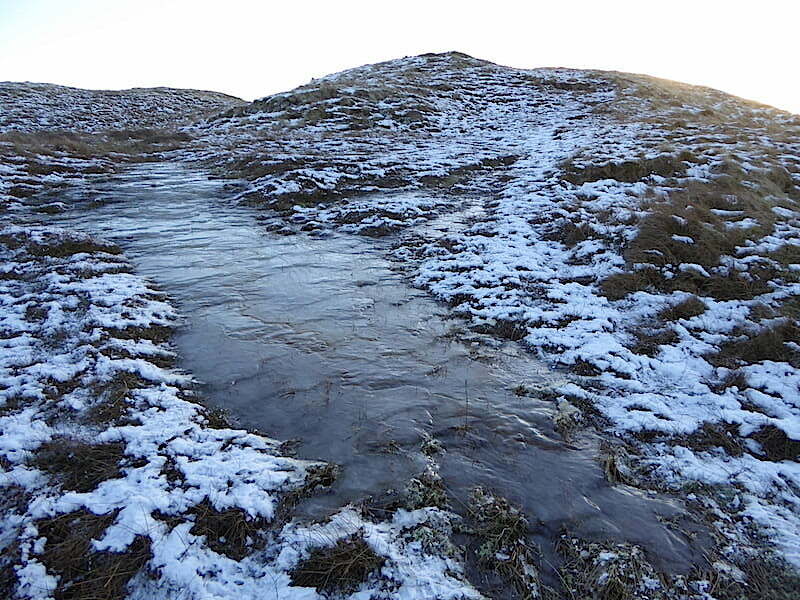 Parts of the path are deeply trenched and full of ice and the spikes went on some distance back. The sunshine was lovely but lacked warmth and after taking this shot looking back at our route so far my gloves went back on swiftly. When we came up here in April one of us was struggling with a gammy leg, now the other one of us is struggling with a gammy back. J is marching on ahead while I’m wincing every time I have to push off with my right foot. I did have a look round to see if there was a stick I could bite on, but is there ever a stick handy when you need one? I took a couple of pain relief tablets before setting out but they seem to taking their time about it. 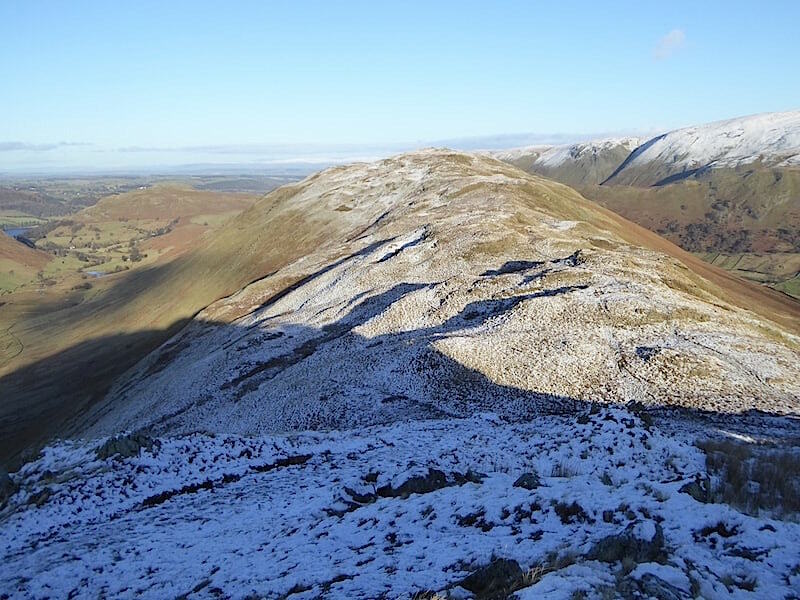 Oh well, there’s not much further to go before we are up on the ridge so I hobble on. 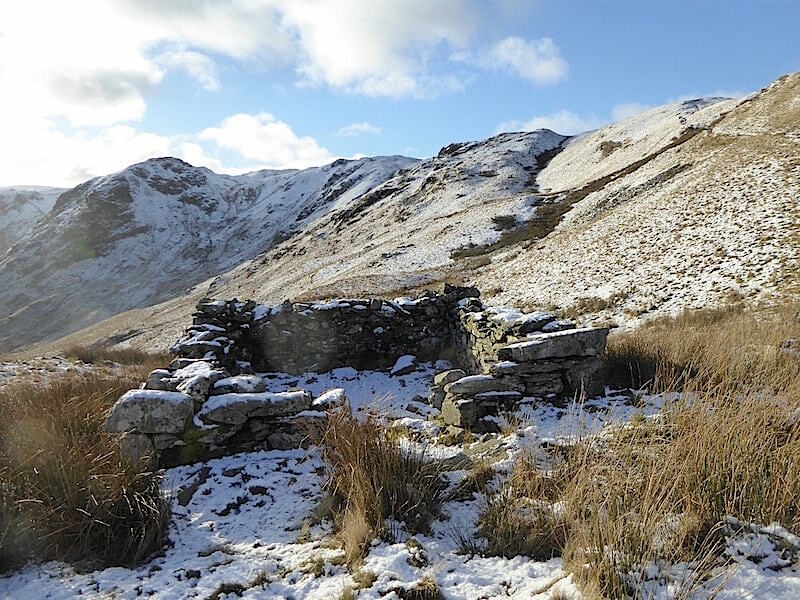 An old sheepfold right beside the path and to the upper right of it you might be able to make out the path we are using. 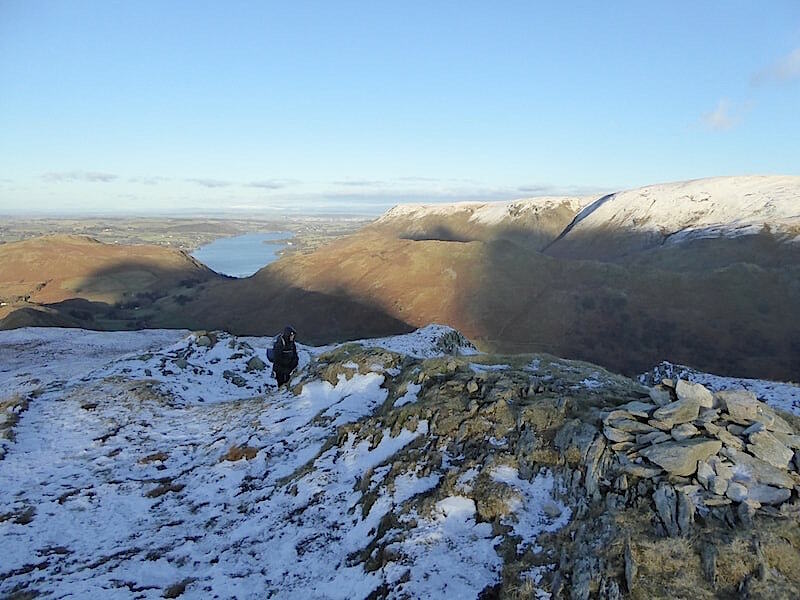 Where it meets the sloping darkish area it turns sharply up to the right over short uphill section and, almost before you realise it, you are on to the ridge. 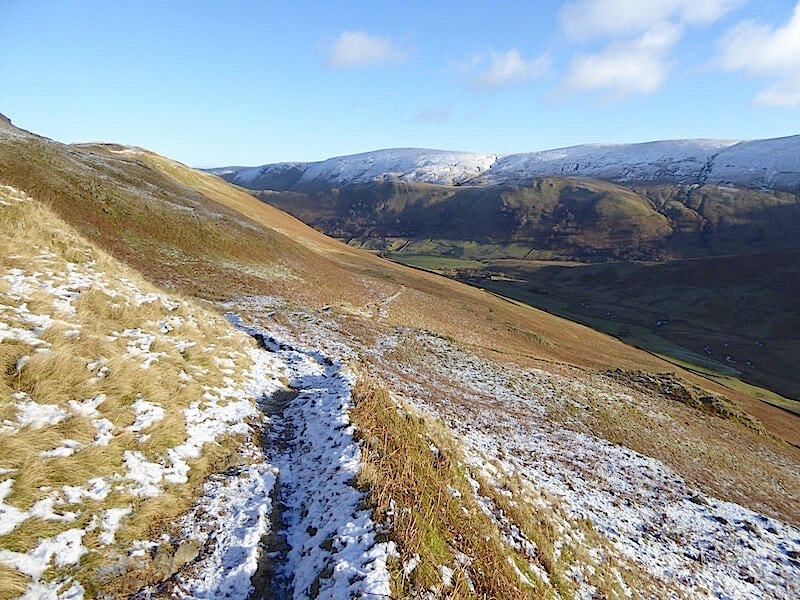 A look back as we round the sheepfold and head along the gentle gradient. 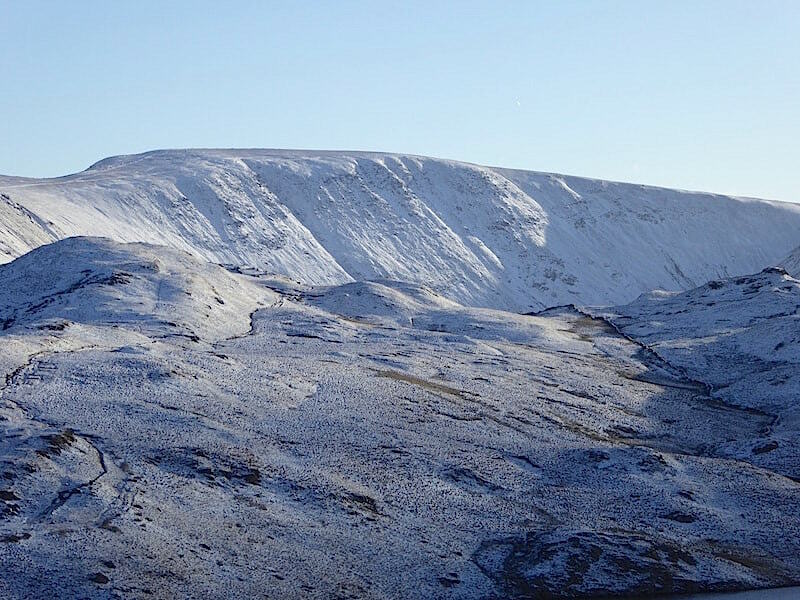 In the middle foreground the dark outline of Gowk Hill beyond which are the snowy slopes of the Loadpot Hill/Wether Hill route leading up to High Raise and High Street beyond that. 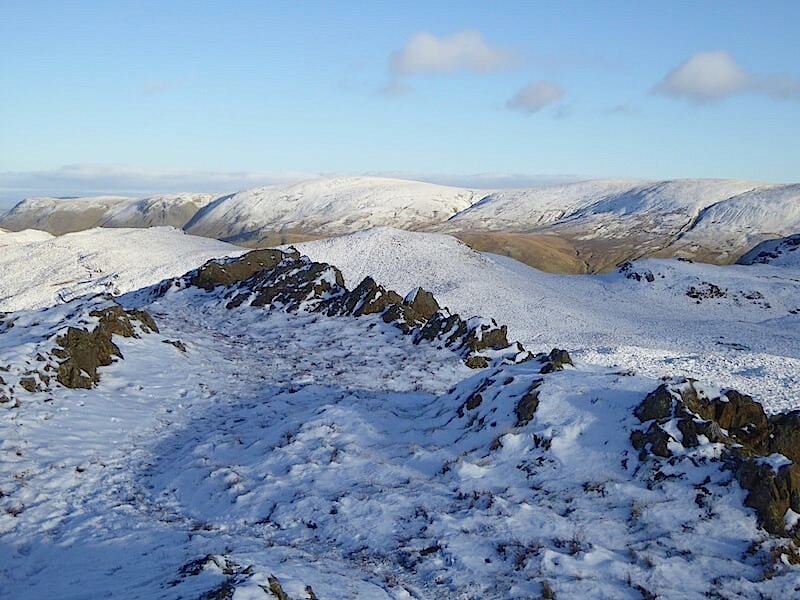 Another look back along Beda Fell as we reach the ridge line and continue on to Angletarn Pikes. The snow is much deeper now so its time for the gaiters to go on, unless you don’t mind having wet socks and wet trouser bottoms flapping round your ankles. 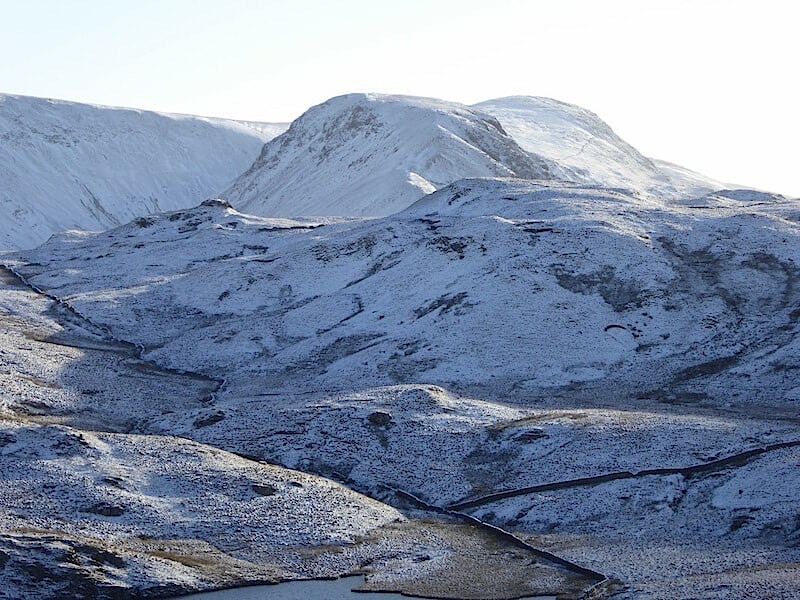 Looking eastwards across the head of Bannerdale as we make our way along to Angletarn Pikes. 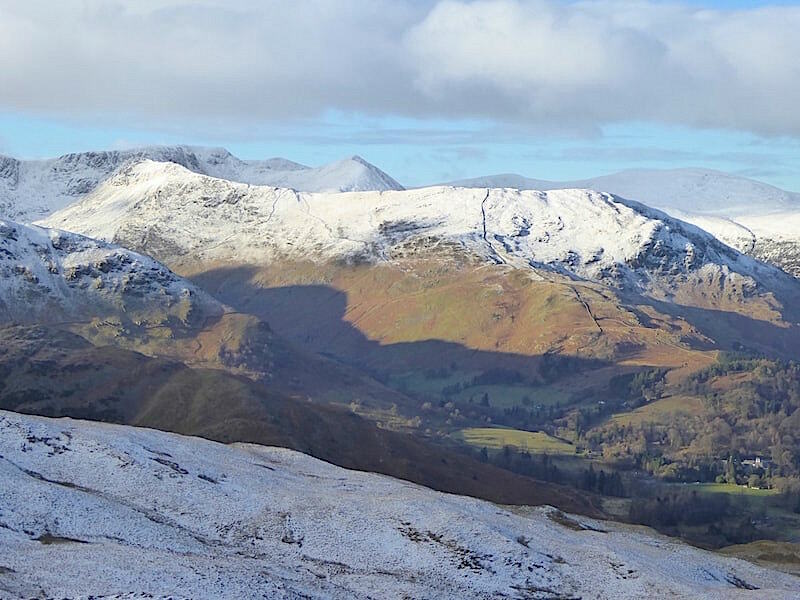 In the middle foreground the sunshine lights up the long saddle between The Nab, on the left, and Rest Dodd, on the right. Now we’ve reached the ridge line we are sitting ducks for the very strong and bitter wind which is coming directly at us us from the west behind me. Jacket hoods go on and get pulled tight around our heads but the wind still manages to get the sides of our hoods flapping against our cheeks. 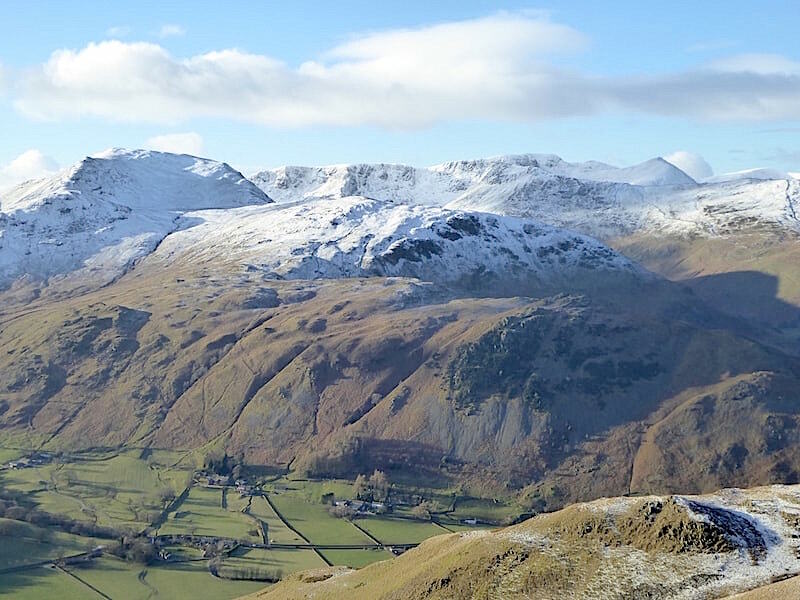 To the west of us across Patterdale the magnificent sight of Striding Edge rising up to the summit of Helvellyn, with Catstycam peeping up over the middle of it. 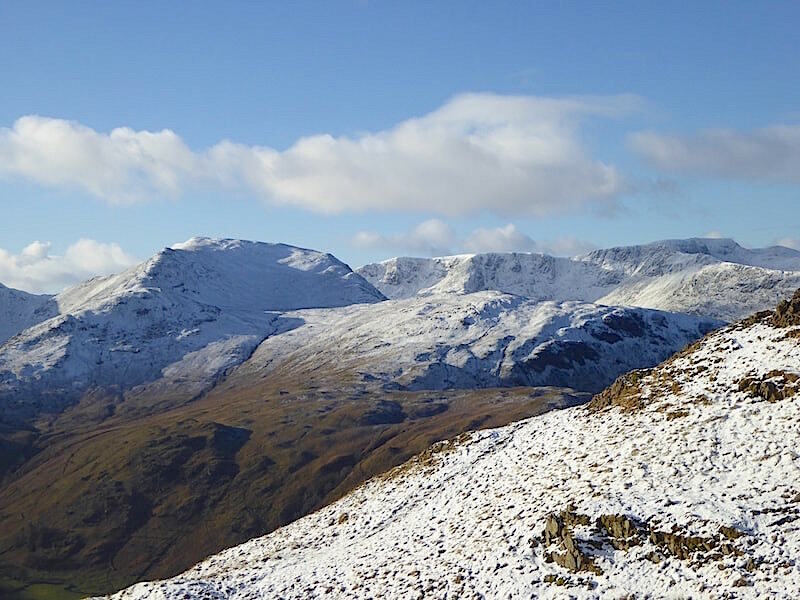 This is a fantastic viewpoint for the fells to the west of us …..
….. Saint Sunday Crag, with its subsidiary peak of Gavel Pike over to the left, looking spectacular in its winter outfit …..
….. as does the mighty bulk of Fairfield and its subsidiary peak, Cofa Pike, just to the right …..
….. while straight ahead of us is the north top of Angletarn Pikes. 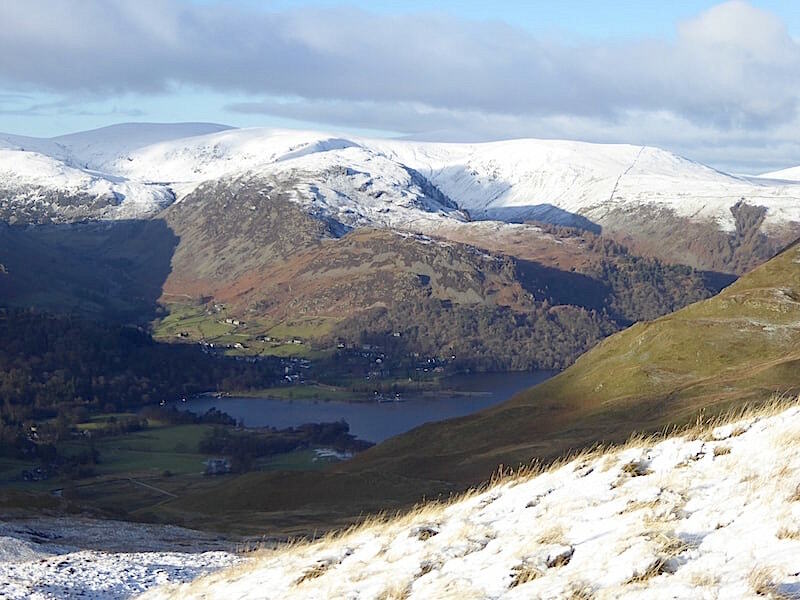 A look over my right shoulder towards Ullswater, with Glenridding Dodd and Sheffield Pike rising above it. 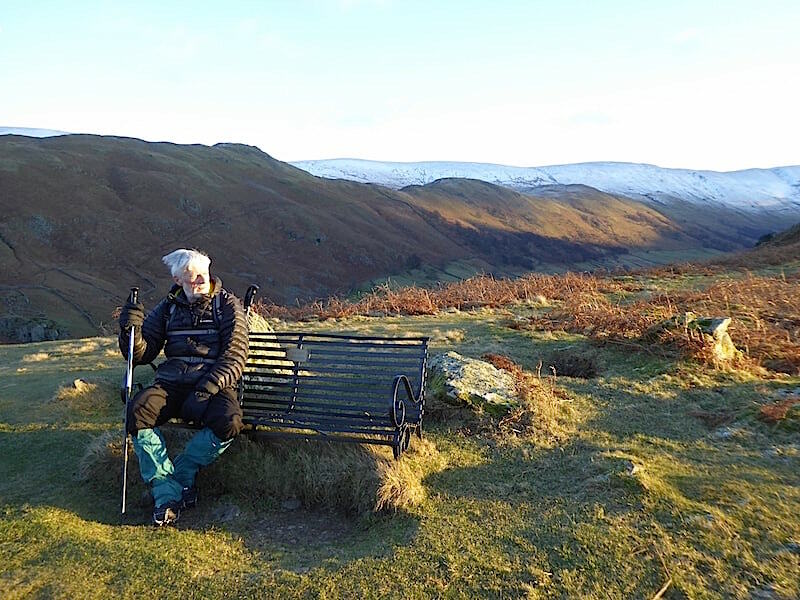 We continue making our way over to Angletarn Pikes, stopping every now and again to enjoy the shelter provided by the numerous small knolls along the way and to get a little relief from the constant battering of the wind. 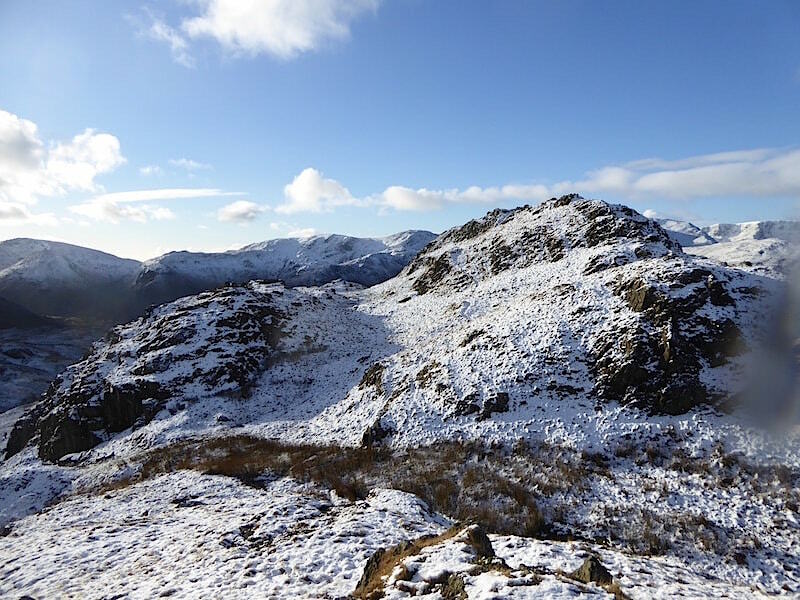 We decided to find a sunny little spot out of the wind, just below the south top on the eastern side of the Pikes, and take a soup and sandwiches break. 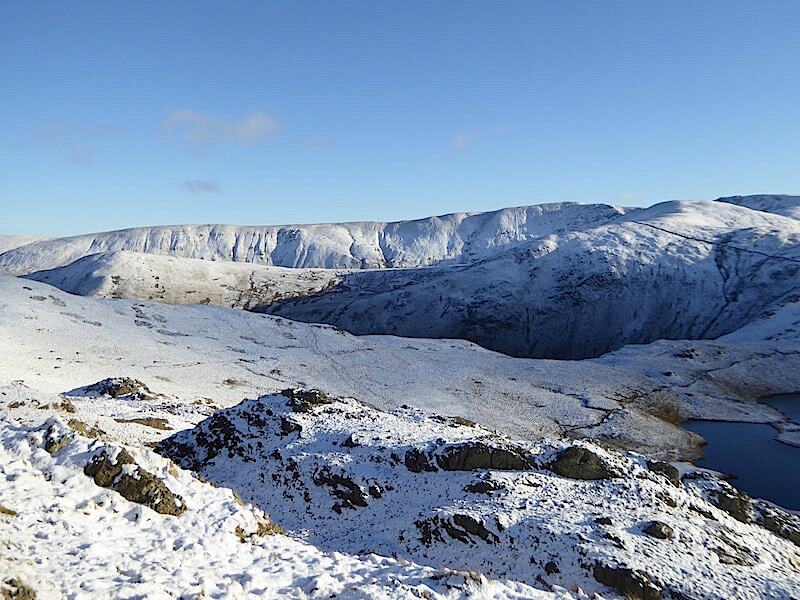 Below are a few photos of the views we had from there …..
….. directly opposite is the long wall snaking below Satura Crag, high above the head of Bannerdale, over to Rest Dodd …..
….. a little further southwards are the two giant humps of Gray Cray and Thornthwaite Crag …..
….. to the east of them is the long plateau of High Street …..
….. while directly below our picnic spot is this captivating view of the always enchanting and delectable Angle Tarn. 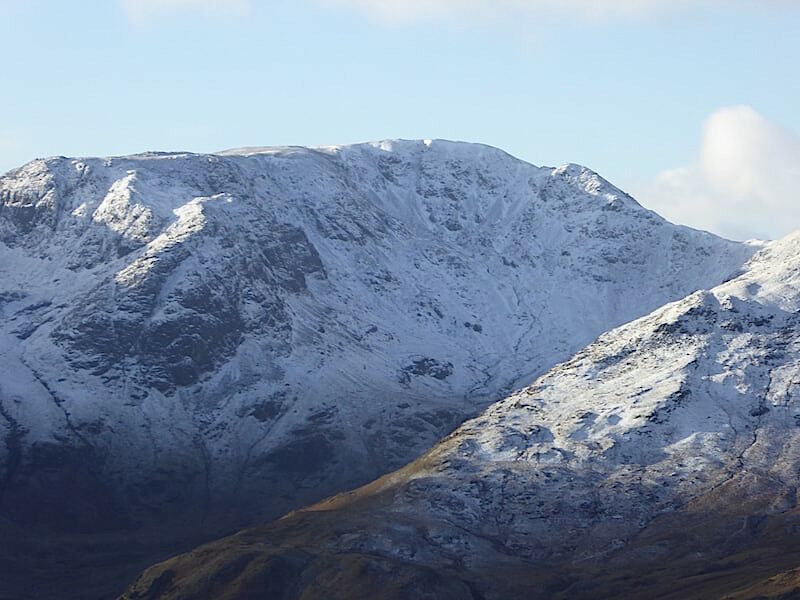 Hot soup, sandwiches, sun on our faces, snow on the fells and my favourite view smack dab in front of me, what more could anyone want? Winter walking at its absolute best. 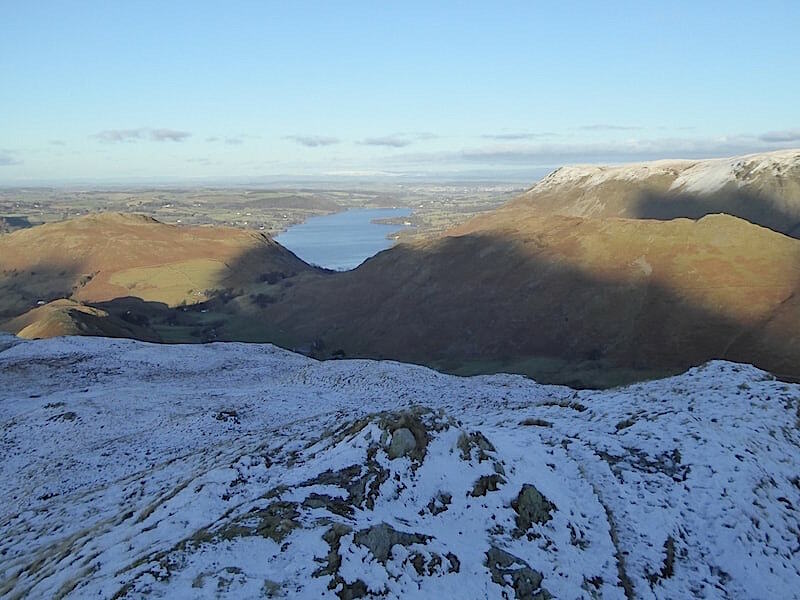 After our break we made our way up to the south top and back into the wind where we have a view of Brothers Water and the fells to the south and west of it. So far we had seen absolutely no-one at all, so deserted was it that we jokingly began to wonder if our fellow citizens knew something that we didn’t and had decided it would be safer to stay indoors. 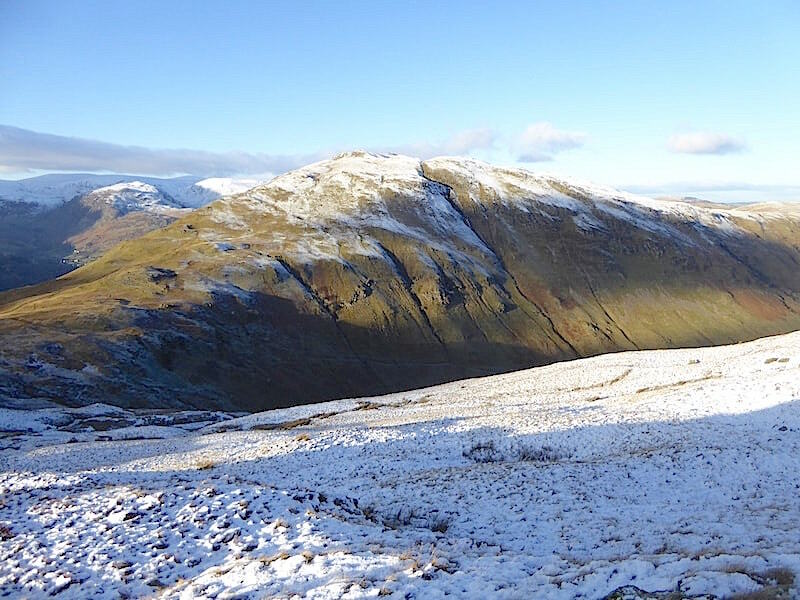 As we reached the south top we saw our first walker of the day just beginning to drop down off the north top, he then disappeared from our view so there was no chance of a brief chat with him. 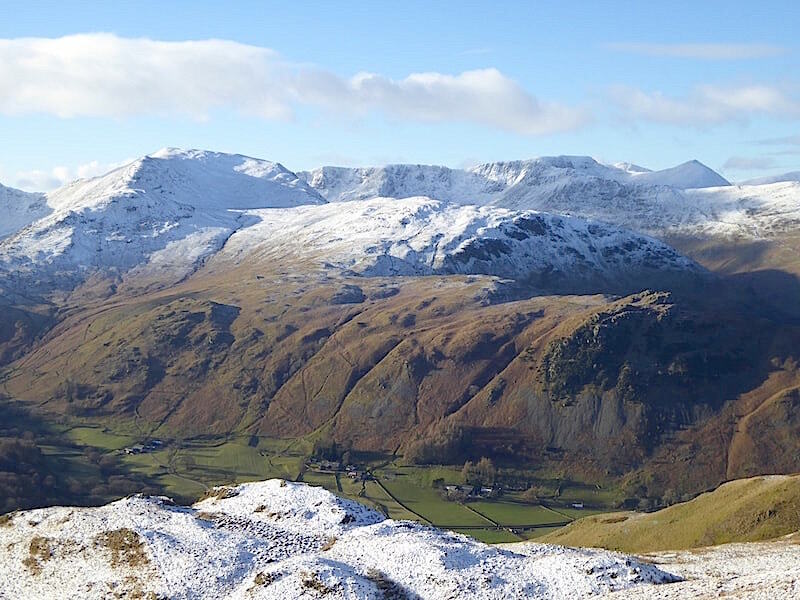 Below are a few views from the south top …..
….. looking west across Patterdale over Arnison Crag and Birks towards Helvellyn and Catstycam …..
….. looking east across the Rest Dodd/The Nab saddle to the High Street range of fells …..
….. looking north towards Beda Fell and Bonscale Pike …..
….. and directly below, well you know what this is by now. 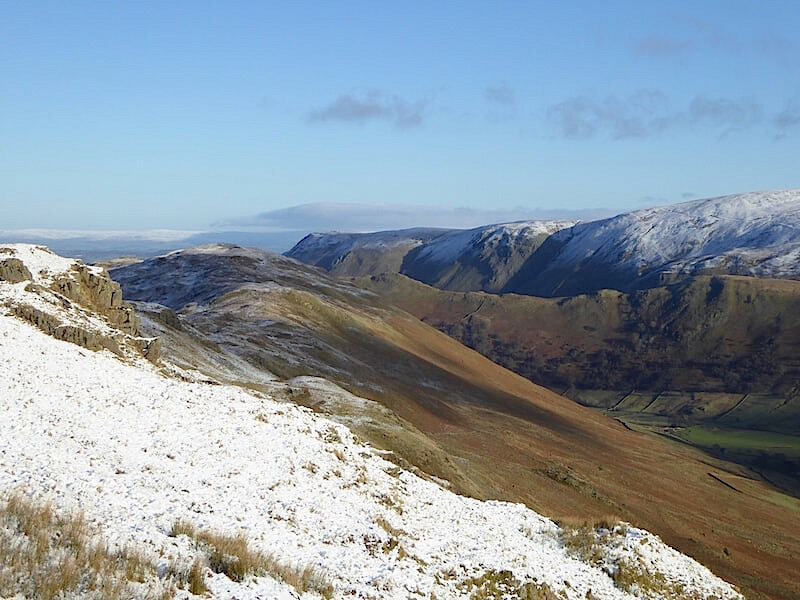 We leave the south top and head over to the north one with those splendid views of Saint Sunday Crag and the Helvellyn range over on our left. 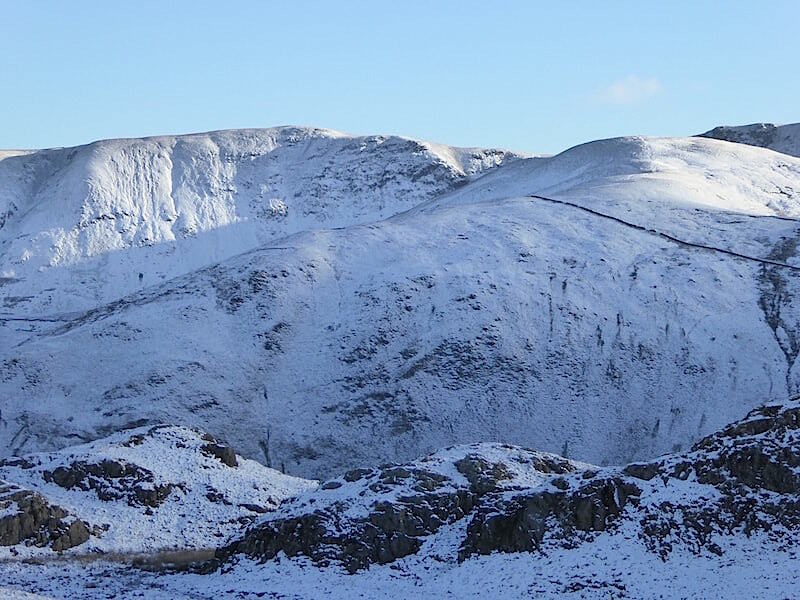 A little further to the south of the previous shot are, from left to right, Dove Crag, Hart Crag and Fairfield. 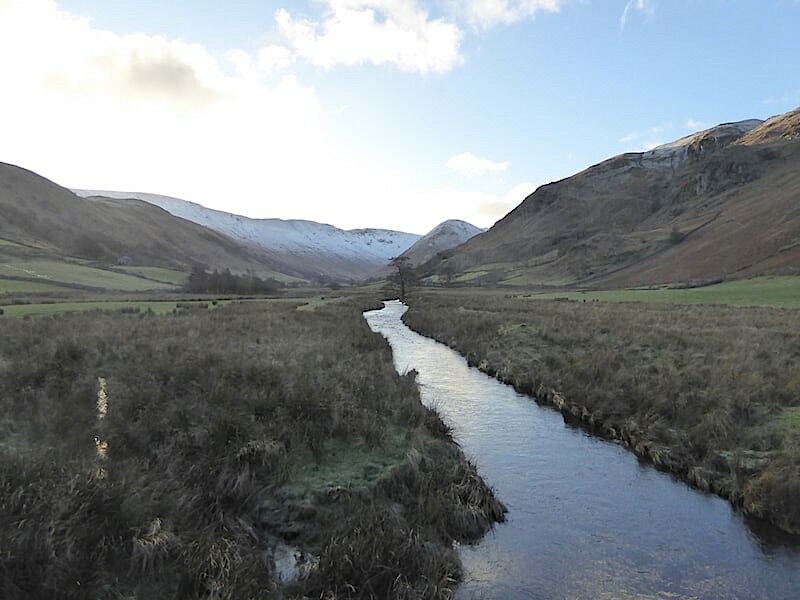 Below them is the still sunless valley of Deepdale, and a good number of days will have to pass before it begins to see full sunlight once again. Two people on the north top as we make our way over. 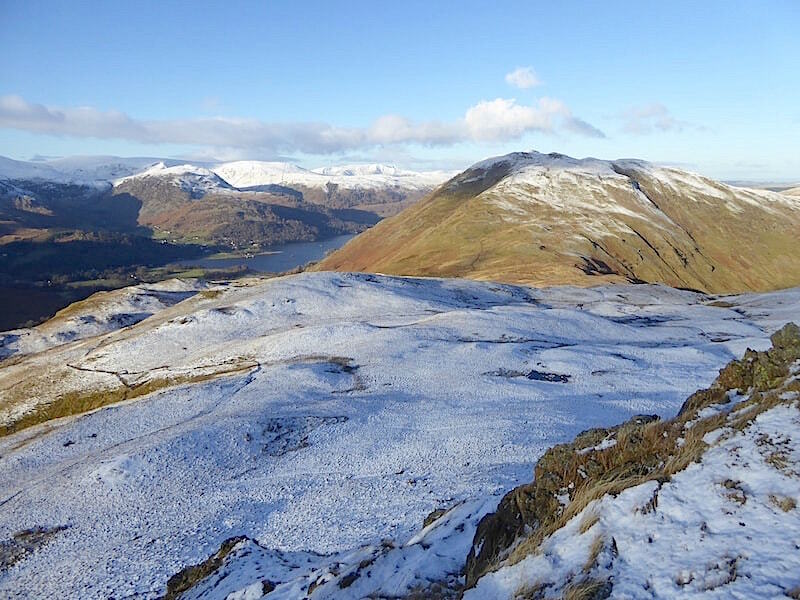 As we got to the top they had settled down to have their lunch but we did exchange greetings and how lovely a day it was to be out in the snow. 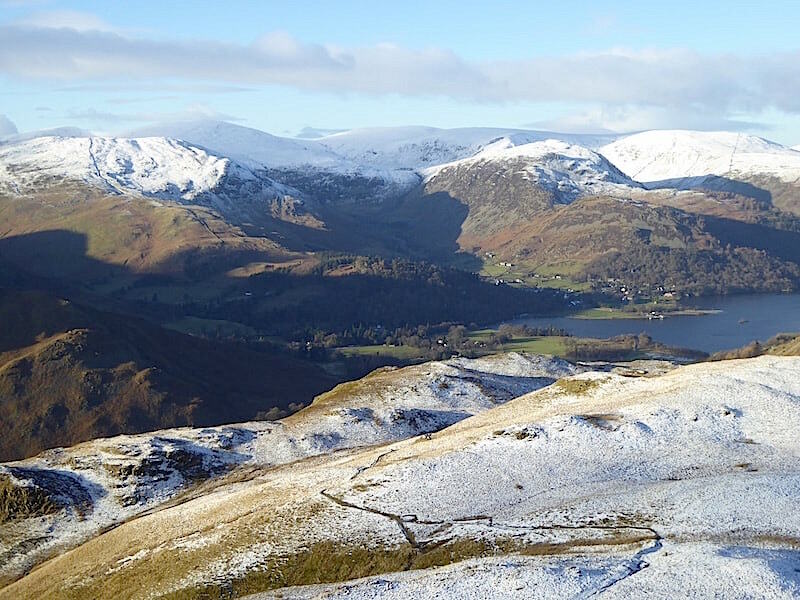 A few more views from the north top …..
….. looking across the frozen grassland and empty pathways for a view over to Ullswater and Place Fell …..
….. looking across to Glenridding which looks as though it has been trapped between the giant pincers of Birkhouse Moor, on the left, and Sheffield Pike/Glenridding Dodd, on the right. 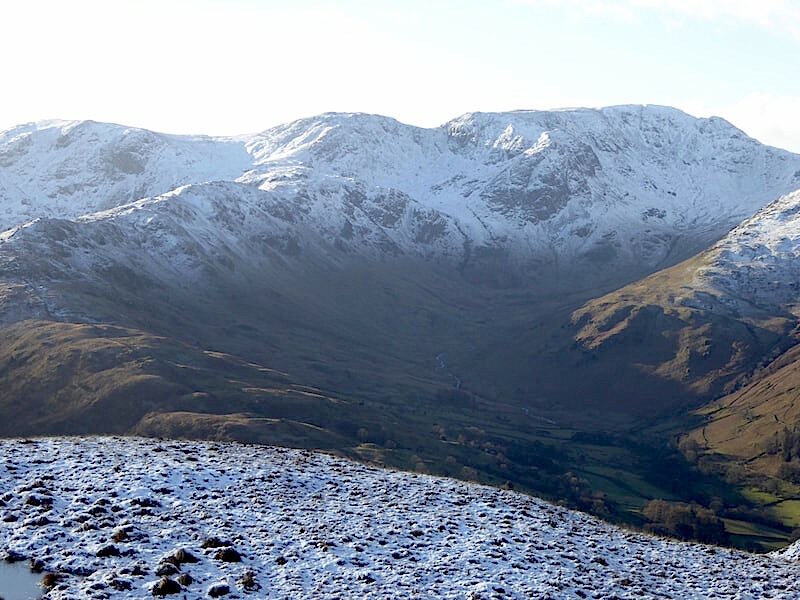 ….. some of the eastern fells to the west of us, which is a contradiction in terms if ever there was one …..
….. and way below us, shimmering in the sunlight, is Brothers Water with the wooded slopes of Hartsop above How to the right of it …..
….. looking eastwards from the north top for a view of some of the far eastern group of fells …..
….. a view of High Street above the south top of Angletarn Pikes …..
….. across the south top again with High Street sloping down towards The Knott over on the left …..
….. and finally, Rest Dodd, on the right, with Rampsgill Head and High Raise behind it on the left skyline. Now its time to be thinking about making our way back so we leave the north top and begin heading northeastwards over the frozen tundra. “Its not tundra, because its not a huge, flat, treeless Arctic region where the subsoil is permanently frozen.” “Well it looks and feels like it.” Oh we do witter on sometimes! We actually met some other walkers as we crossed over, a group of four youngsters, late teens sort of age, and a Mum, Dad with their two junior school age children. All of them with friendly hellos and great day greetings for us, which we returned in kind. 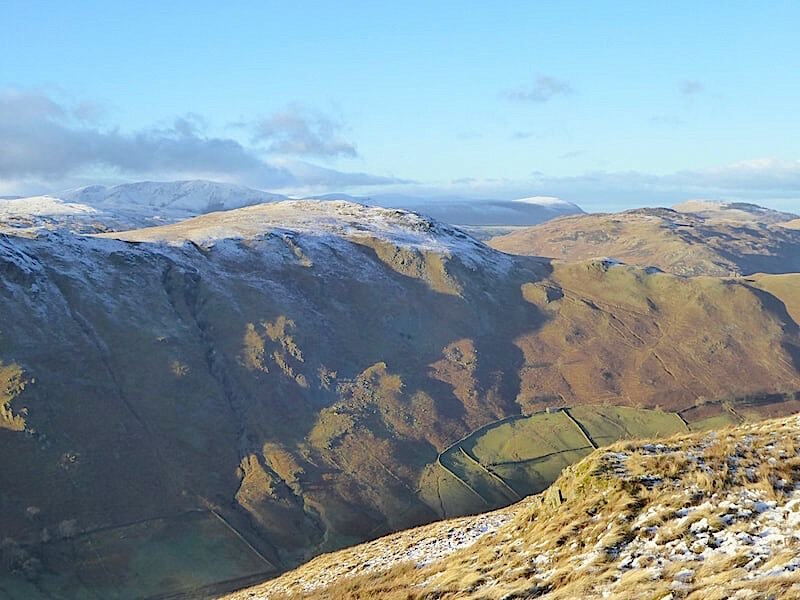 Place Fell, its southern side being beautifully lit by the afternoon sun and Boredale Hause casting a deep shadow down the steep drop into Boredale. 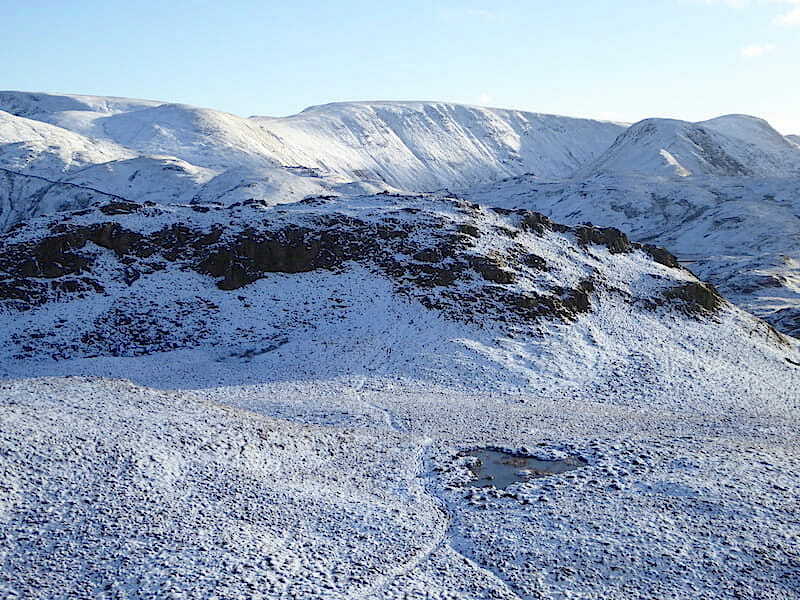 Poor old Place Fell, on this side it never hangs on to its snow for quite as long as most of the other fells. 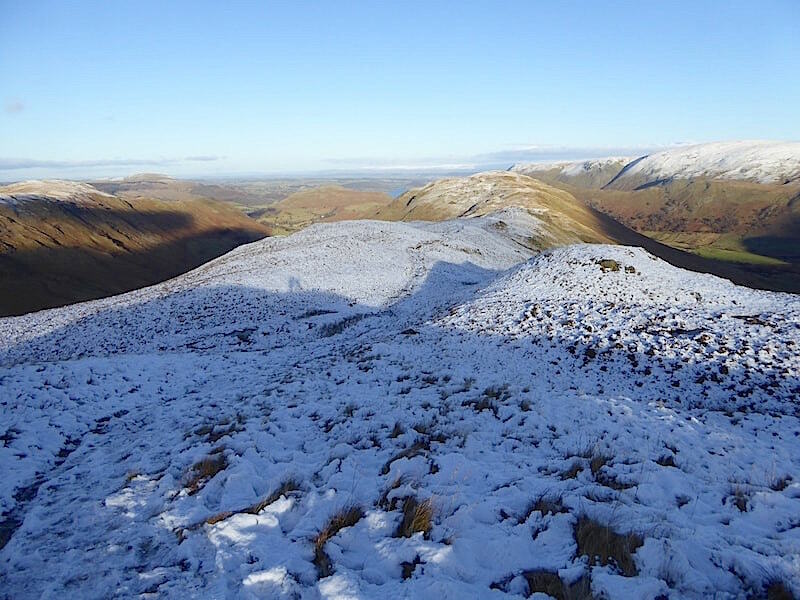 The two of us, plus our shadows, tramping, not dashing, through the snow and not a one horse open sleigh in sight. In fact the only other thing we saw along here was one lone male walker also heading in the same direction as us but a very long way ahead. 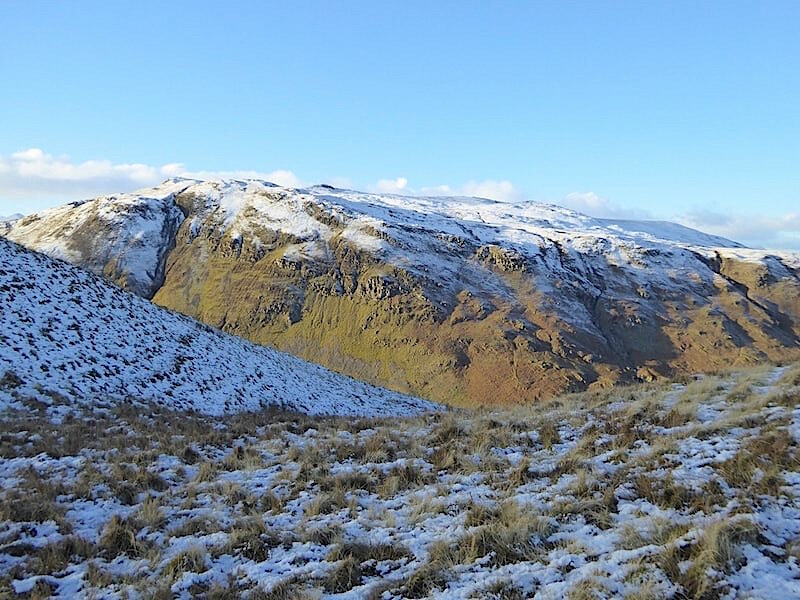 He’s not in the shot having just disappeared below Bedafell Knott, the last snowy hump in front of the brown slopes of Beda Fell beyond. A cloud drifts in front of the sun leaving us at the mercy of the strong cold westerly wind. We had the occasional respite when we dropped into a hollow now and again but for the most part it was a battle and we took a constant battering from it. 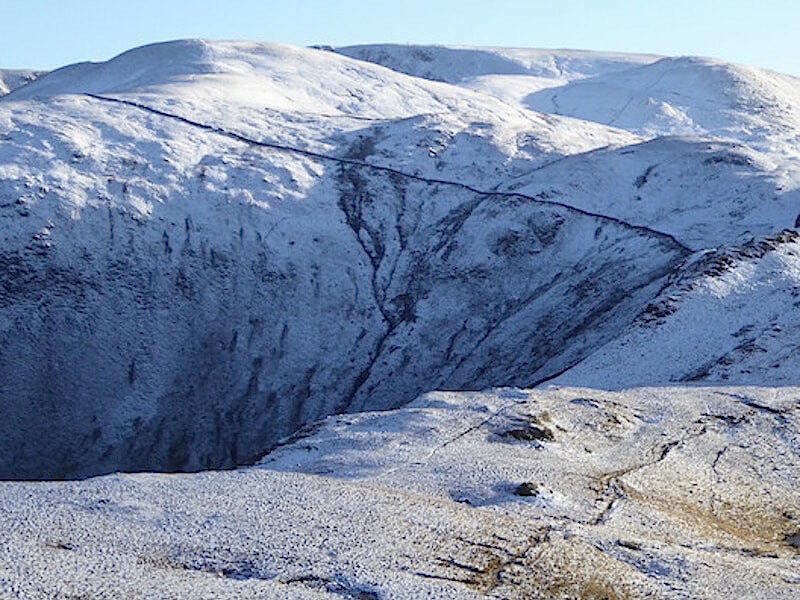 On the right just below you may be able to make out this morning’s ascent path and the short climb up from it to the ridge path we are now walking on. 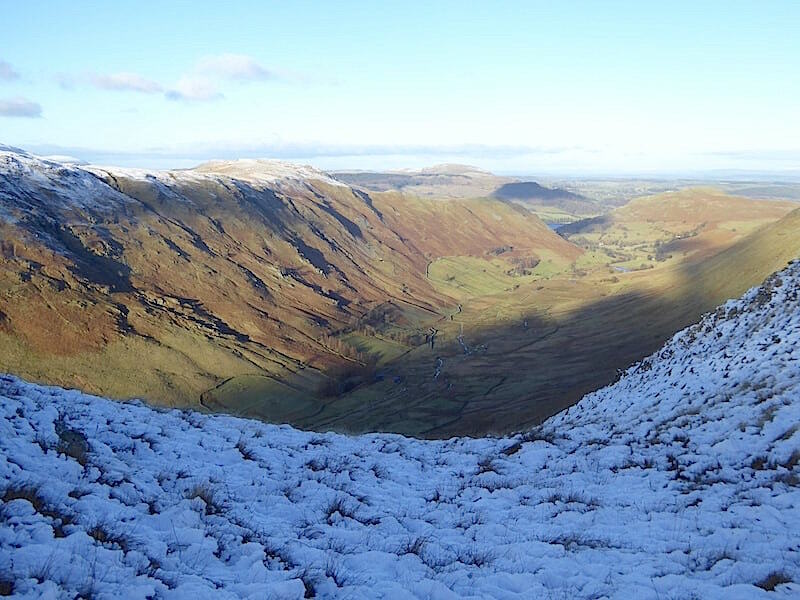 A lovely view of a sunny Boredale as we cross the numerous humps and bumps. 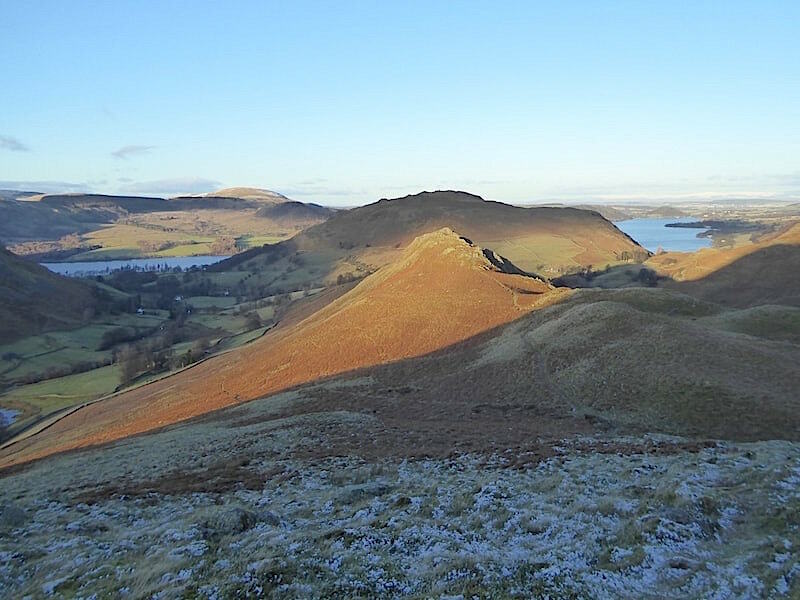 The view from Bedafell Knott from where we drop down sharply and continue across more humps and bumps over to the summit of Beda Fell. 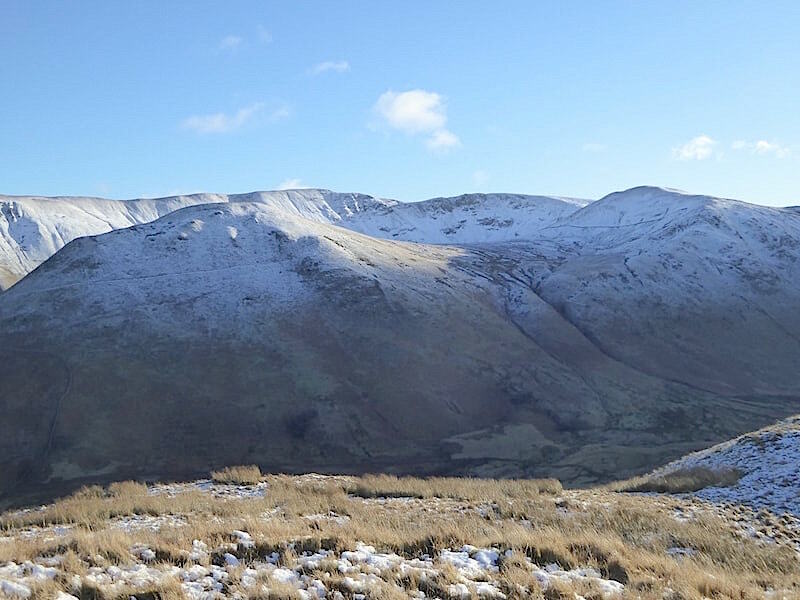 Back in the sunshine and on our right we have a view of Rampsgill Head across the saddle between The Nab and Rest Dodd. 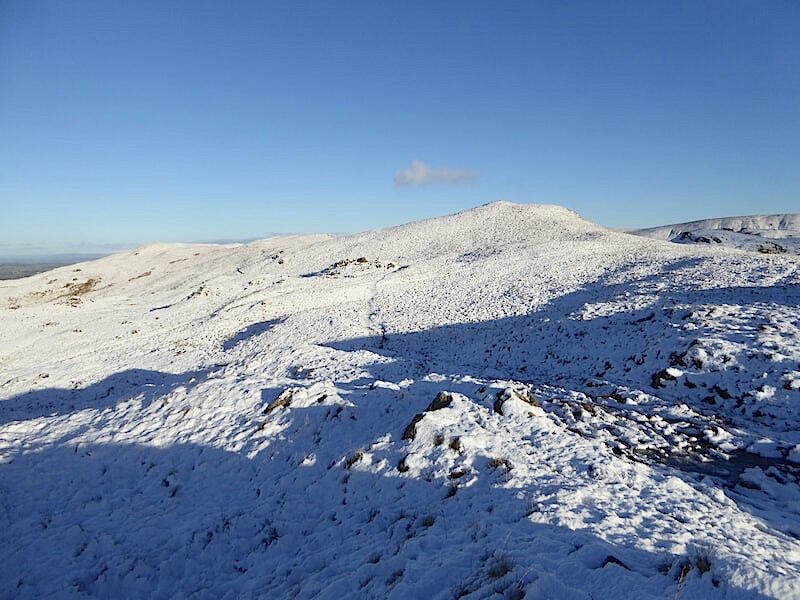 The unpleasant brown peat hags in the middle of the saddle should be nicely frozen solid just now so a good time to take a walk over. Nobody else seemed to think so though as there wasn’t a soul to be seen. 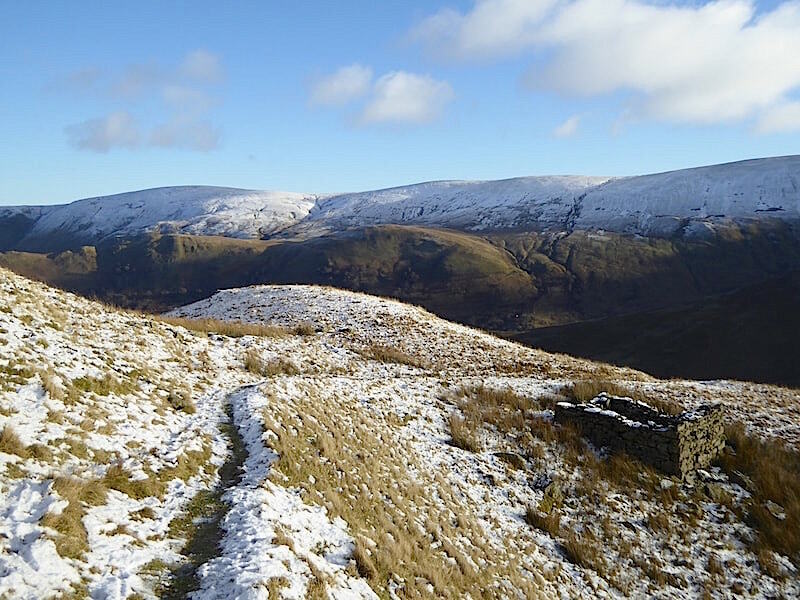 From the shelter of one of the hollows a view of the path leading up to Beda Fell summit. It was so nice just to be able to stand up straight and not be having to lean against the buffeting wind all the time. The weather forecaster last night had not mentioned one word about the presence of strong winds today so it was rather unexpected, not to mention unwelcome. 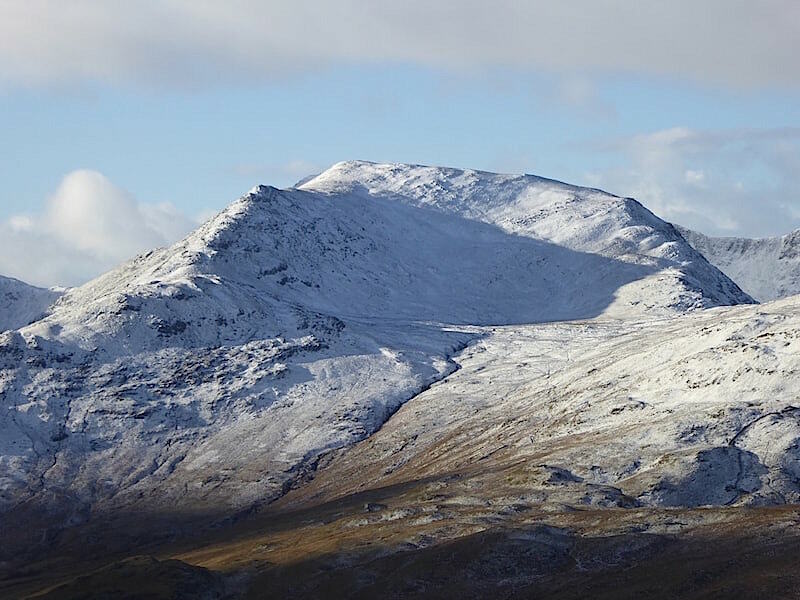 The steep and craggy eastern face of Place Fell, the summit is the the little darkish pimple to the left of the centre skyline. 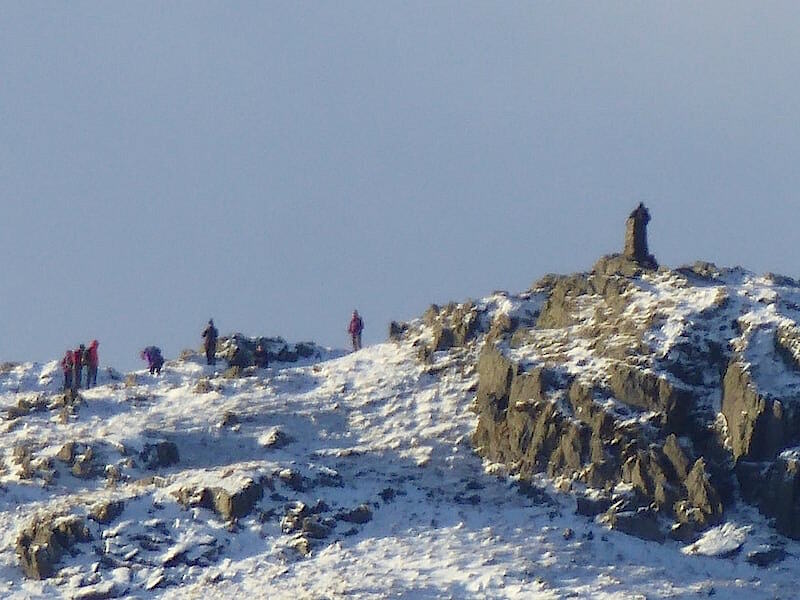 We could see tiny figures moving about on the summit areas so I chanced a shot using the maximum amount of zoom that the camera has to offer. I had to take half a dozen shots before I got one that was halfway decent thanks to the wind blowing me and the camera every which way. In the end we resorted to standing back to back so we could brace one another and maybe get some degree of stability. Even so it was difficult and although its a bit fuzzy this shot was the best one of the lot. 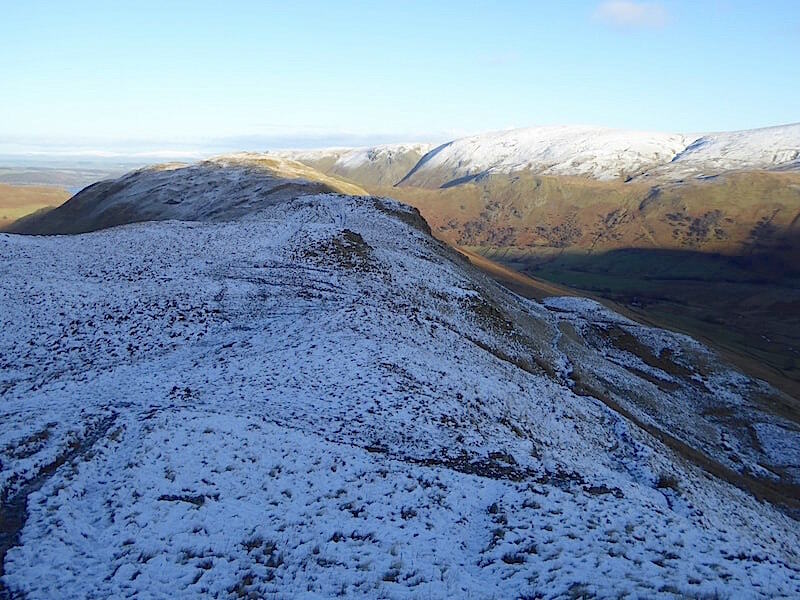 High above Boredale now as we tramp over Beda’s ridge with a view over to High Dodd, one of Place Fell’s subsidiary tops. 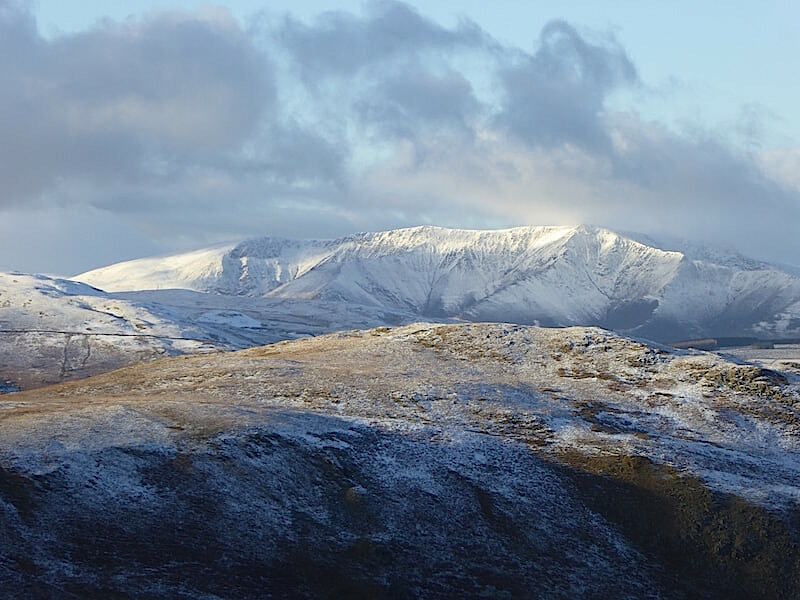 Beyond High Dodd is the magnificent Blencathra. It speaks for itself so I don’t think I need to say anything more. 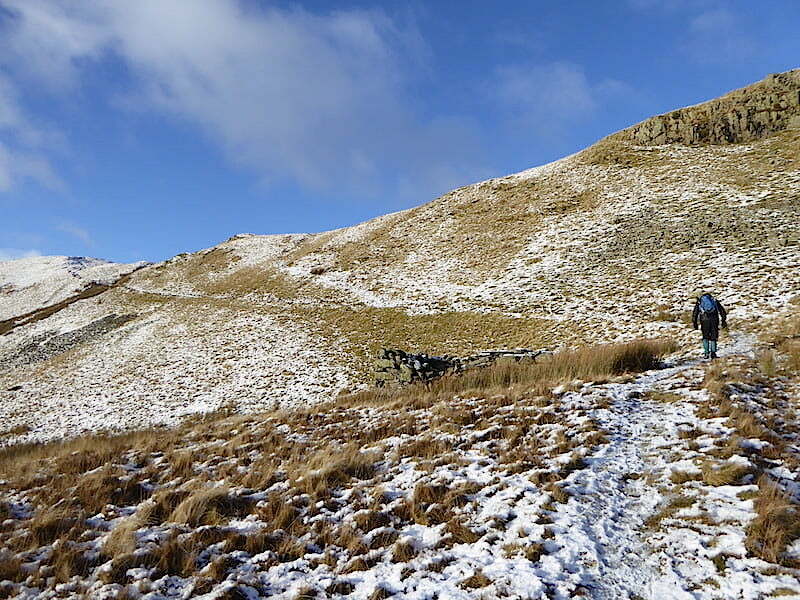 A section of path which was fairly typical of the conditions underfoot today. 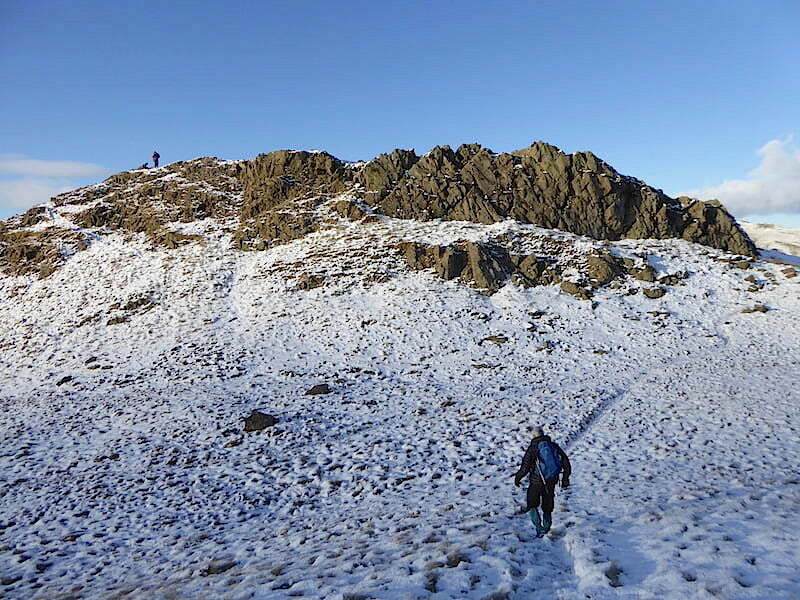 If I’d had a fold up sledge in my pack I could have got it out and had a go. 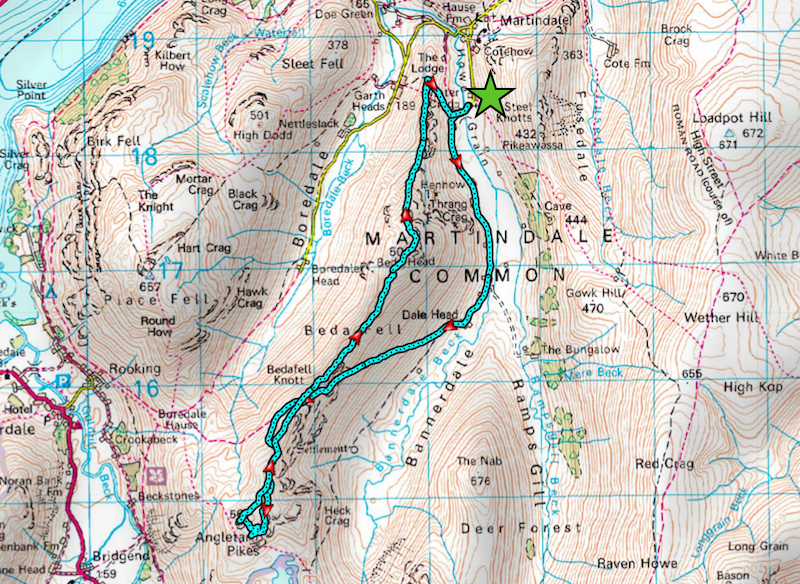 On second thoughts though perhaps not such a good idea, unless you want to take the high speed route down to Boredale. 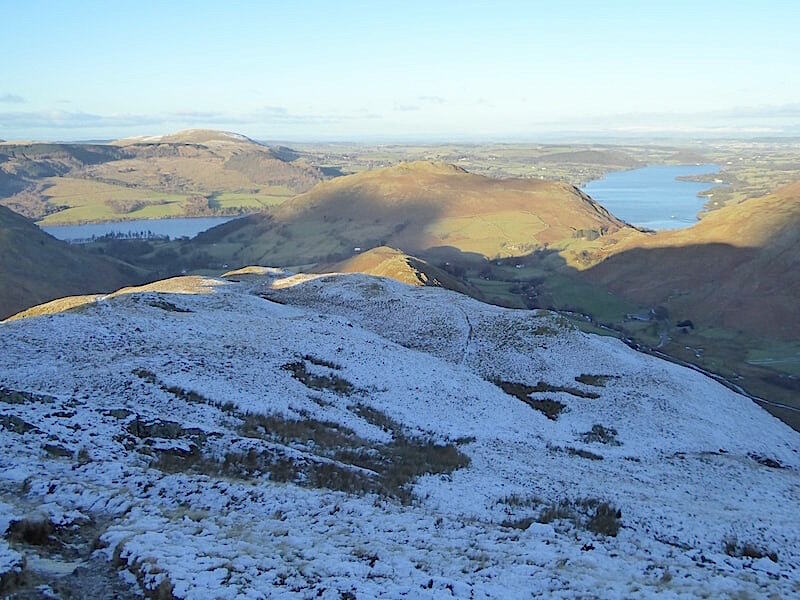 The summit of Beda Fell and a view along the length of Ullswater. It was still blowing a hooley so we didn’t hang about for a photo shoot. Gloves back on and off we go again, there’s still a lot of down to be walked before we are anywhere near the car. 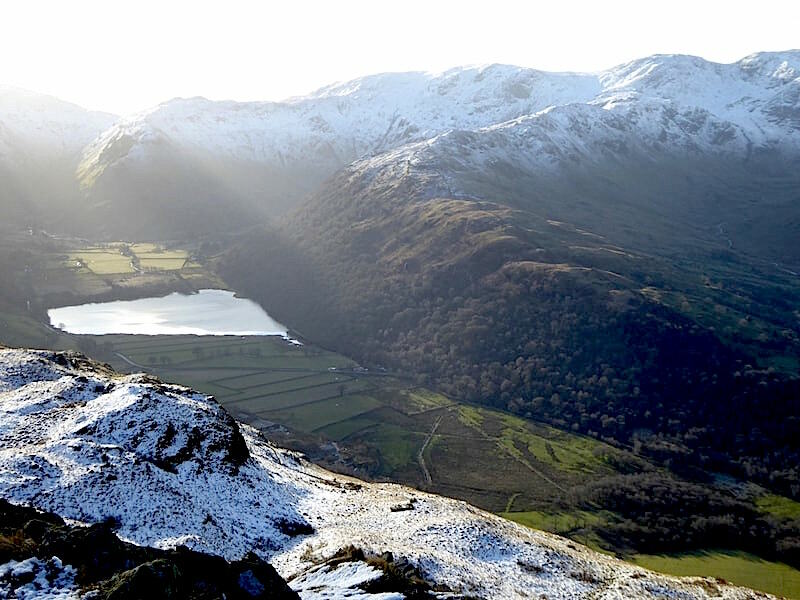 On the way down with Ullswater nicely framed by Hallin Fell, on the left, and Steel Knotts on the right. We’re still being blown all over the place by the way. 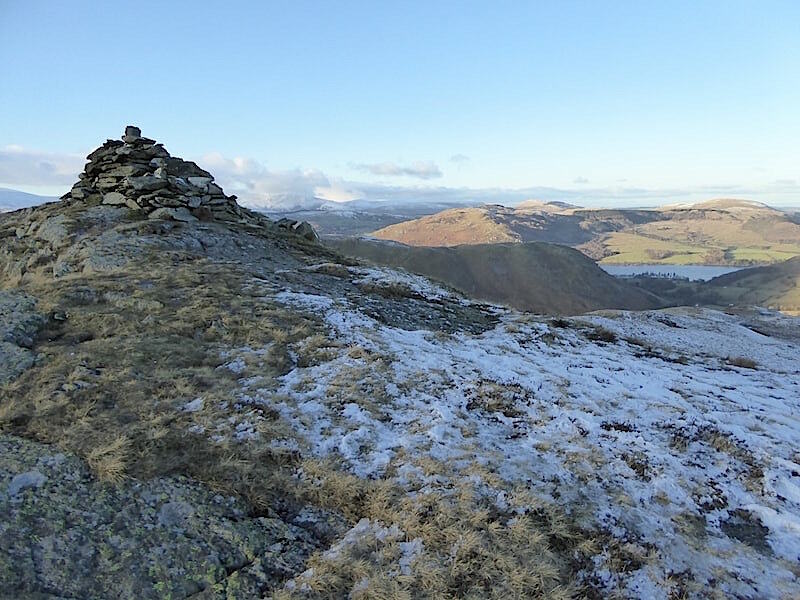 A waymarker cairn and viewpoint along the way, somewhere above Thrang Crag I think. Behind us the summit of Beda Fell is now blocking the sunlight and keeping us in the shade for a while. 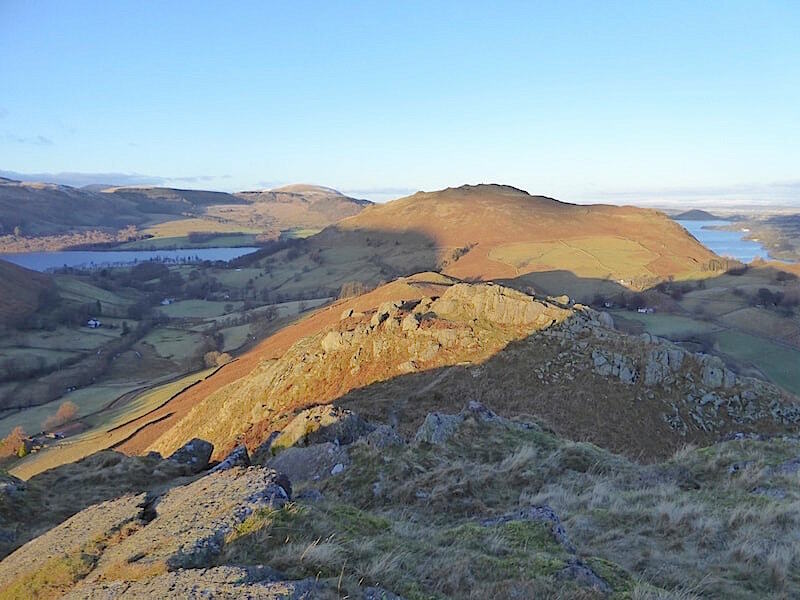 No matter, Hallin Fell and Ullswater still have some sun and we can enjoy the clear as a bell view all the way across to the northern Pennines. 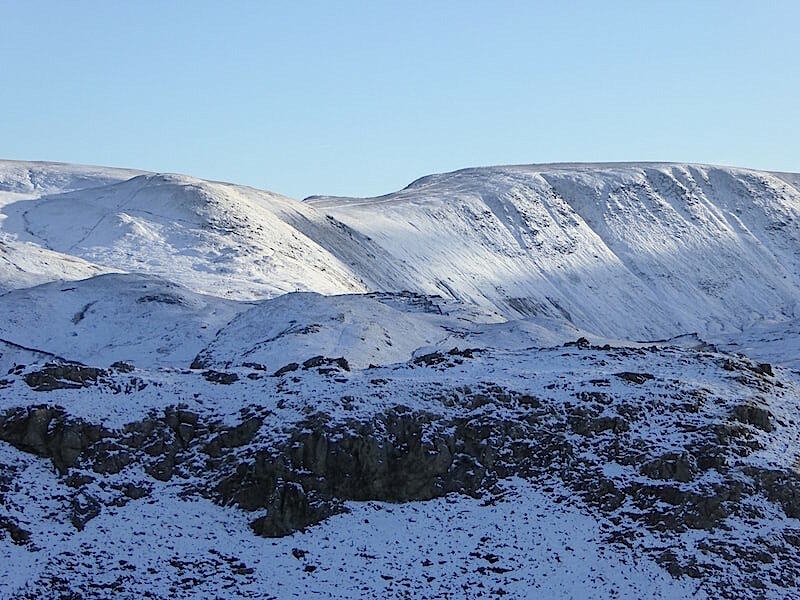 Suddenly, and quite of the blue, Winter Crag gets a burst of sunshine. 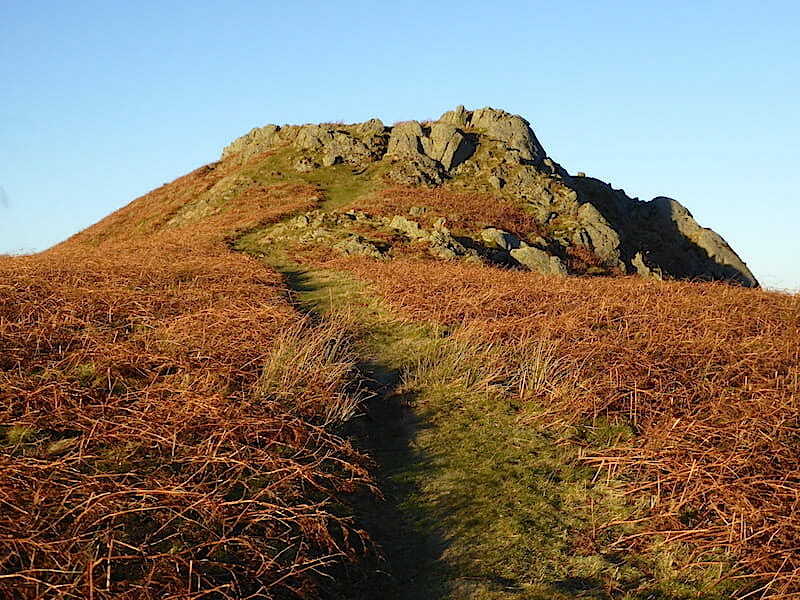 The camera doesn’t do justice to the fiery red colour of the dead bracken …..
….. but it did as we got closer to the craggy top. A short and simple climb to the top …..
….. from where there’s this view of the next set of humps and bumps to be negotiated, but its not at all difficult and once we are over the last set of outcrops …..
….. there’s the very welcome sight of the bench with a view, nicely situated at the junction of four paths where we will turn off to the right and then drop down to Winter Crag Farm and back to the car. 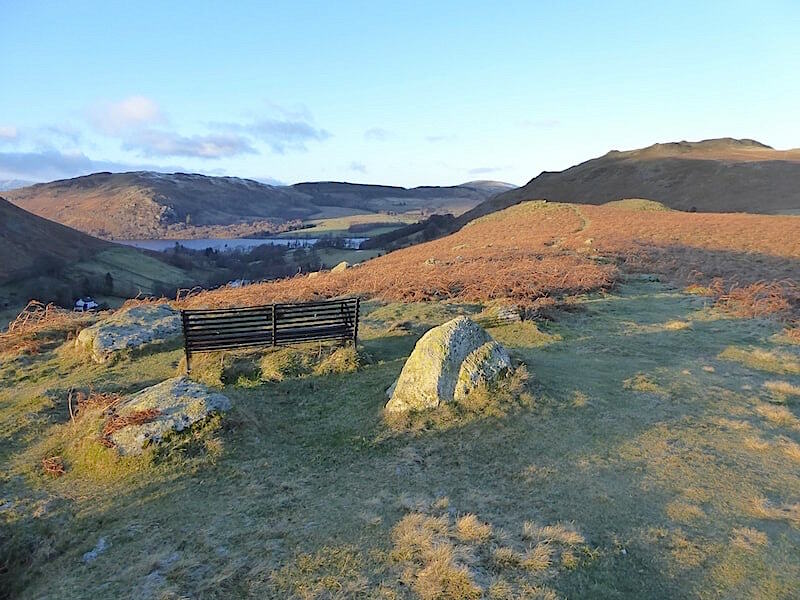 Before that though …..
….. as a bench has kindly been provided we take the opportunity to sit for a minute or two and enjoy the glow of the afternoon sun. Its only three o’clock but the shadows are lengthening, the day is drawing to a close and we are out of the wind at last. Just nice to sit in the peace and quiet and think about whatever you want to think about. 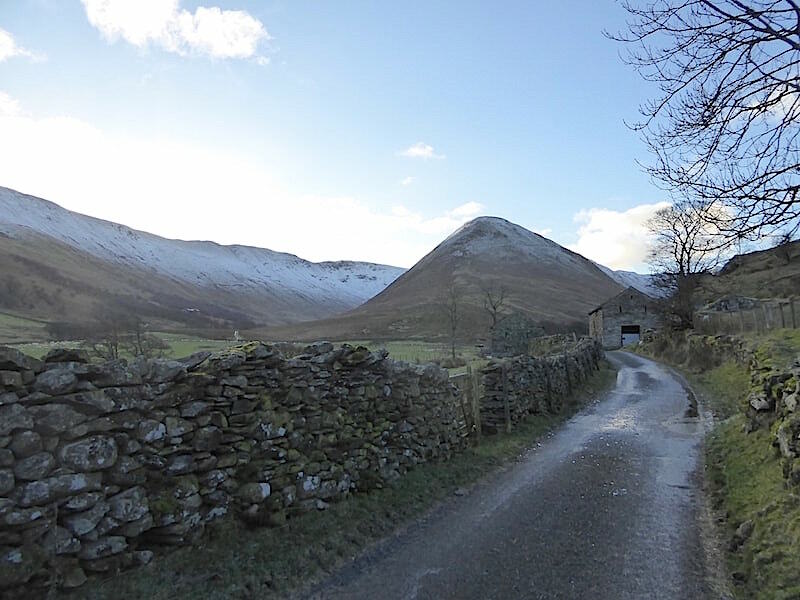 Eventually we have to leave the warm glow on the western side of Beda and make our way back down its eastern side and down into Martindale once again. 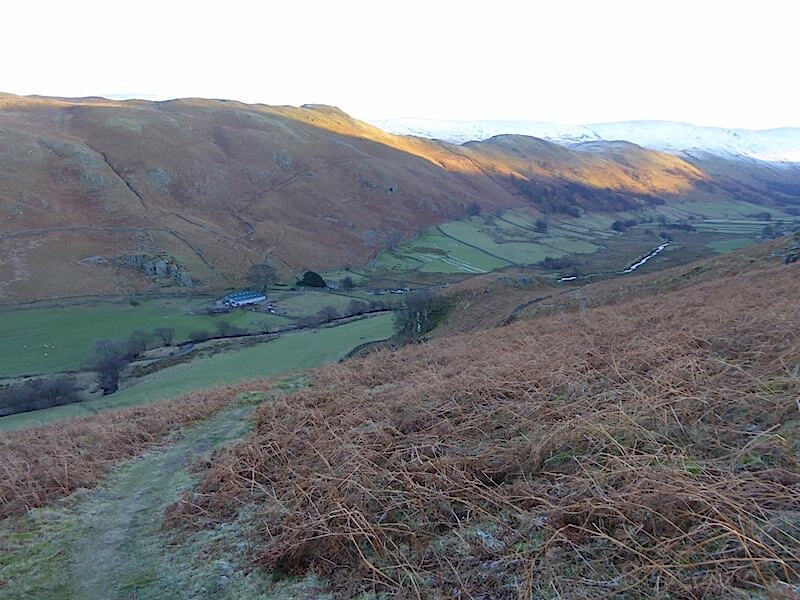 The valley now in sombre mood with just the top of Steel Knotts enjoying the last rays of sun as I look southward along it …..
….. then looking to the northern end of the valley where the tree tops at The Hause below Hallin Fell are also glowing in the light. 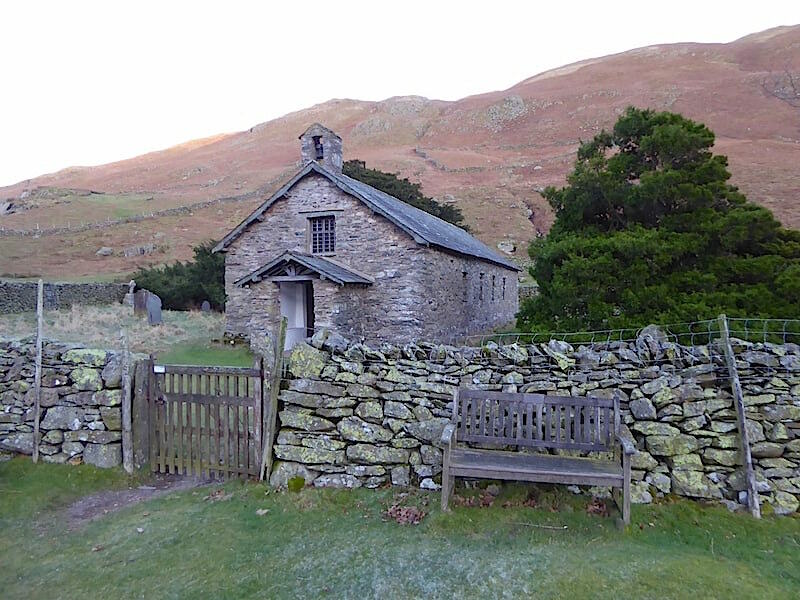 We cross Howe Grain Beck once again with the valley looking more or less as it did when we set out …..
….. and back to the car by the old church and its ancient yews where I thought back to previous visits to the church. We didn’t go in today which was unusual because we generally do. When we got back home there were two urgent sounding messages waiting for me, there was also one on my mobile but it was tucked away in an inside jacket pocket and I hadn’t heard it ringing. Having listened to the messages I knew that the request for a call back would not bring good news and it didn’t. Sufficient to say that I no longer have an older brother so this lovely walk is dedicated to him. For Geoff – may you rest in peace, with your beloved Jean, forever.